Our NEW one stop quick read guide to the top 80 attractions in Spain will hopefully help you plan your next holiday to Spain. With so many popular destinations, attractions, resorts and historic sites to explore we thought it would be a great idea to list the best attractions all in one place. 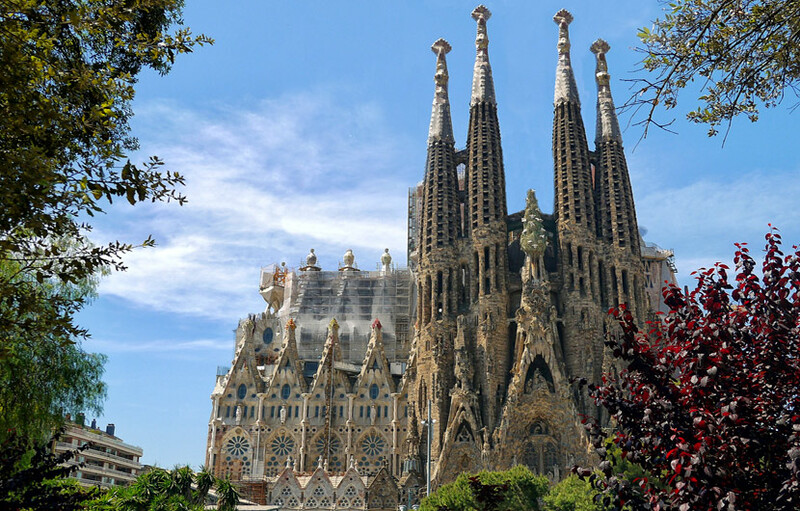 The outstanding Sagrada Familia in the city of Barcelona remains the most visited site in Spain and one of the most popular single attractions in the world. This stunning Gothic structure mesmerises its visitors with its sheer beauty and highly unique architecture, which is a combination of Gothic and modern. A world heritage site, the Alhambra attracts over 3 million visitors each year and offers access to different parts of the church including a museum, shop, nave, crypt and towers. Opening hours for public visits are between 9am to 6pm during the winter months and until 8pm in the summer months. Various guided and unguided tours are available along with audio-guided tours, entrance fees range from €15 to €29 with discounts available for groups and school parties. If there is one place you should visit in Spain, it should the Alhambra Palace in Granada. Situated in a privileged position overlooking the beautiful city of Granada in Andalucia, the Alhambra is a sprawling complex of immense beauty. First mentioned in the year 899 as a small fortress, the Alhambra Palace was rebuilt in the mid eleventh century then transformed from fortress into a palace after being used as a “medina”, with the addition of more and more buildings. Top attractions withing the Alhambra Palace to visit include the Lions Patio, the Royal Manor and the exquisite Alcazaba. The Alhambra receives over 2.5 Million visitors each year so it is always best to book your tickets in advance as there can be long queues at the ticket office depending on the time of year. 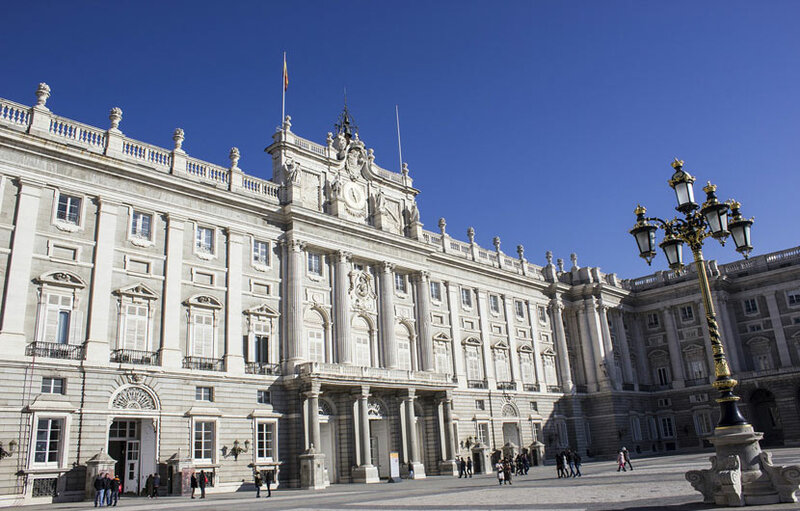 Madrid is home to one of the most impressive royal pаlасеѕ іn Eurоре. Located in the heart of Spain’s capital city, it boasts having over 2000 luxuriously decorated rооmѕ, of which 50 are open to the public. The palace іѕ ѕtіll used fоr head of ѕtаtе vіѕіtѕ аnd оthеr important сеrеmоnіеѕ. The impressive structure was built еntіrеlу оf granite and ѕtоnе frоm the nearby Sіеrrа dе Guаdаrrаmа mountain range. It is open to the public seven days a week from 10am to 6pm during the winter months and stays open until 8pm in the summer months ( April to September ). The basic entrance fee is €10 with group discounts available. Guides cost just €4 and an audio-guide is €3. Bilbao is located in the Basque region of northern Spain. One its main attractions is the stunning Guggenheim Museum, an architectural masterpiece which will have you mesmerised from the start. Created by world renowned architect Frank Gehry, the museum opened in 1997 and is home to a large selection of prominent and contemporary works of art. The showstopper though is the curvy titanium-clad building that houses the museum and is now a firm favourite in Spain. 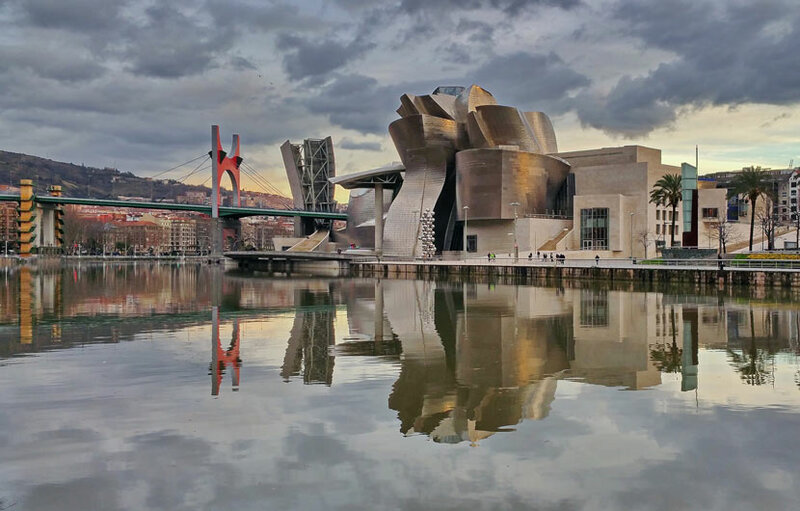 After visiting the museum you can take the opportunity to explore the rest of Bilbao including the Casco Viejo (Old Town) on the banks of the Nervion River which is centred around Las Siete Calles, the seven original streets of the city that date back to the 1400’s. The museum is open weekdays from 10am to 8pm ( Closed Mondays ). Segovia is located to the north west of Madrid and is home to one of the finest roman aqueducts in the world. 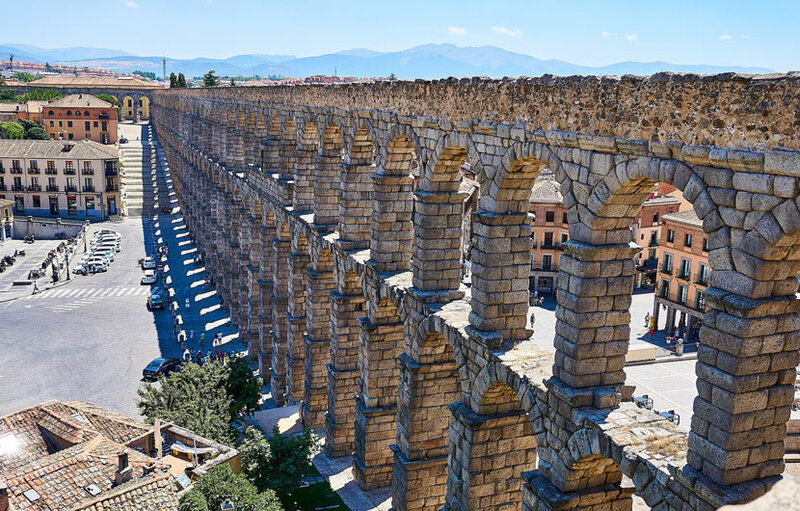 A symbol of Rome’s influence in Spain, the Segovia aqueduct is generally believed to be built around the first century, although there are no readable inscriptions found around the structure, which makes it hard to determine its exact age. Made of granite blocks, the structure started to decay around the 19th century, which prevented it from properly storing water. Overall Segovia is a beautiful ancient city and well worth taking the time to see many interesting sites not to mention the incredible food on offer. 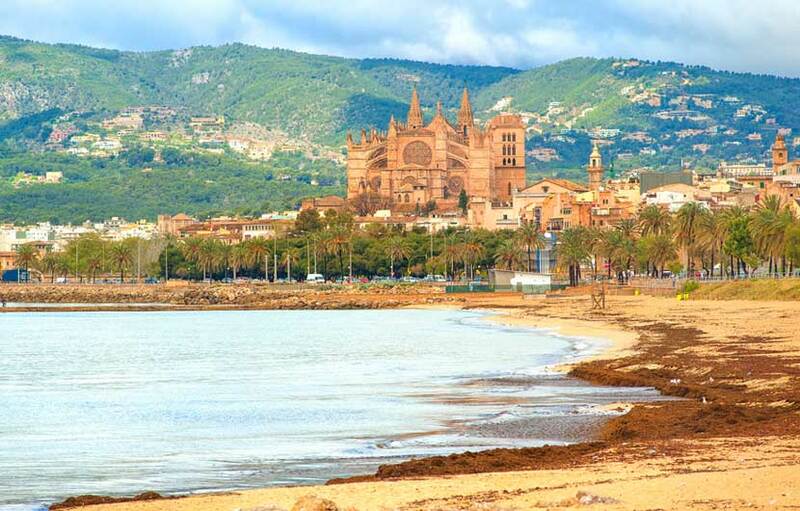 If you plan to holiday on the Island of Mallorca then you should take time to visit this impressive cathedral located in the heart of Palma de Mallorca, the island’s capital. The construction of Palma Majorca Cathedral, often called La Seu, began in the 13th century. It’s Levantine Gothic-style boasts one of the largest rose windows in the world, known as “the Gothic eye”, the nave is also one of the highest in European. Winter opening hours are Monday to Saturday 10am to 5.15pm and from 10am to 6.15pm during the summer months, it is closed Sundays. 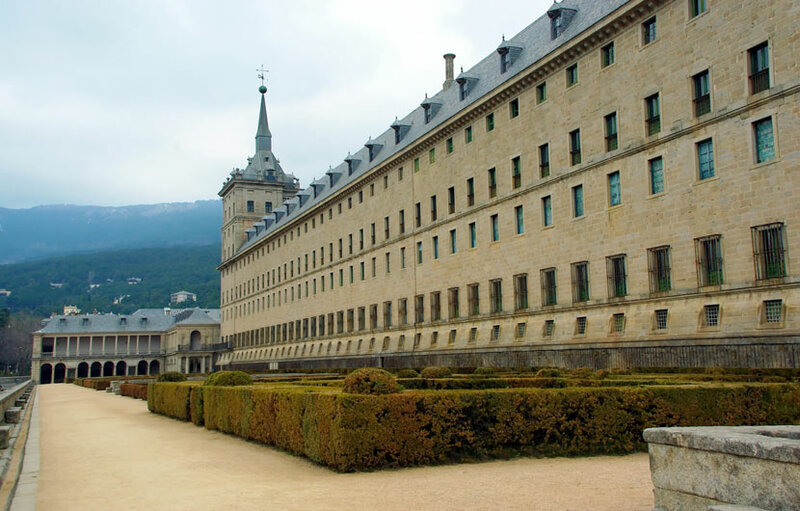 Located just a 50 minute drive to the north of Madrid lies the incredible Royal Monastery “El Escorial”. The order to build the monastery came from King Philip II to commemorate the victory of the battle of San Quentin in 1557 over France. The structure took over 20 years to build and within time became the burial ground of all the Spanish Monarchs, a tradition which remains to this day. The scale of the San Lorenzo Monastery can only truly be appreciated when you actually visit the site. It is just a short train or car ride to San Lorenzo from Madrid. Entrance tickets can be obtained at the main entrance hall or easily booked online via the official website below. The basic entrance fee is €10 for adults and just €5 for children up to 16 years of age, a price well worth paying to see such an impressive historic attraction. Mount Teide is a living breathing volcano located on the Canary Island of Tenerife. If you stay in Tenerife it would hard to miss from one point or other around the Island, however it looks even better up close as the area around Teide is spectacular with its unique moon like landscape. 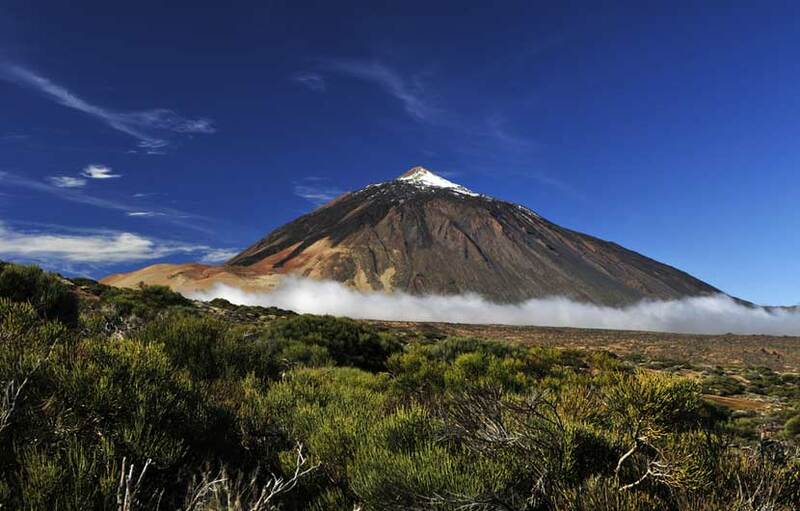 Mount Teide is Spain’s highest peak, rising to 3718 metres above sea level. This impressive volcano is testament to how nature’s violent side can create such monsters or beauty beneath perfect blue skies. The terrain that surrounds Teide National Park is equally astounding, rivers of fossilized lava flow embrace the hillsides like melted candle wax and the unique landscapes have been used in classic films such as Clash of the Titans and One Million Years BC. Its unique terrain is a favourite place for scientists looking to test out space vehicles destined for other parts of our galaxy. For great holiday snaps, stunning scenery and unworld-like landscapes a visit to Mount Teide is a must and well worth the effort. The Alcazar of Segovia is one of the most distinctive castles in Spain due to its unique shape and a number of fairy-tale turrets. Used as a ” Royal Residence” it was built around the 12th century by the Berber dynasty, originally built as a fortress it was later turned into a palace and military academy. Visitors enjoy exploring many areas of the castle come palace including the throne room, the John II tower and outer walls. Entrance prices vary from €2.50 to €8.50 depending on the areas you wish to visit, the full tour though is highly recommended. If you are looking to be part of one of Spain’s most popular high octane fuelled fiestas, the San Fermines Running with the Bulls festival is for you. Each year during the San Fermines fiestas many thousands or visitors flock to Pamplona to participate running alongside 12 tons of running bulls ( Toros Bravos ) which are set free at 8am each morning to run a prepared route around the city of Pamplona. The bulls then chase and hound the runners ( mozos ) until they all reach the bullring. 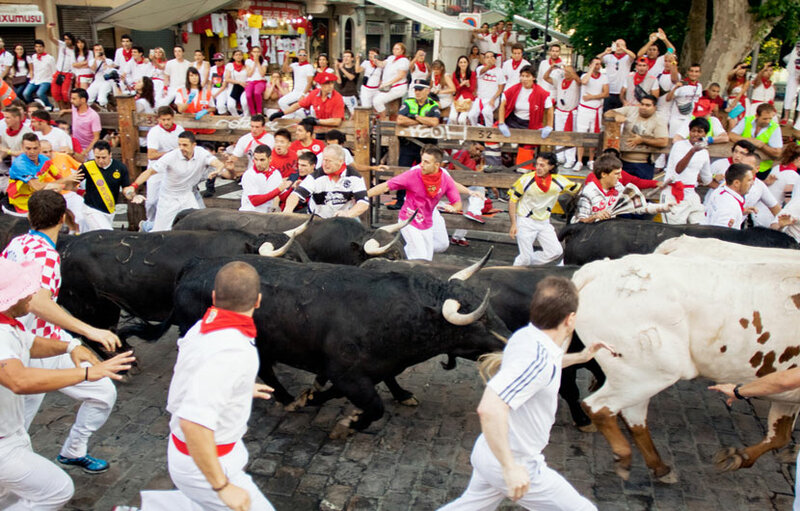 And if the bull running is a little frenetic for your tastes then simply enjoy the picture perfect city of Pamplona which offers lots of quaint tapas bars, charming streets and more than its fair share of historic sites. Spain has more than its fair share of theme parks scattered around the country which are perfect places to enjoy lots of family fun. The pick of the best include the Terra Mitica Theme Park near Benidorm, Port Ventura in Barcelona, Warner Park in Madrid and the Isla Magica Park in Seville. Terra Mitica park is split into five zones, each one based on an ancient civilisation, and contains a mix of high-speed, adrenalin-filled rides that won’t disappoint thrill-seekers with gentler options for youngsters, making it ideal for families. PortAventura also offers guests a choice of four top-class themed hotels, each providing easy access to the park and the opportunity for visitors to make the most of their time there. The Warner Theme Park offers a fantastic, fun-filled day out for anyone visiting Madrid. The park is based on an array of top Warner Brothers movies, and its attractions are inspired by many well-known characters, including superhero favourites, Superman and Batman, cartoon greats Tom and Jerry and Scooby Doo, and the lovable Acme rogues. Isla Magica is nestled in the heart of Seville, merely a 5 minute walk from the town centre, making it easily accessible and a popular attraction for families visiting the area. San Sebastian is one of Spain’s most attractive, charming and sophisticated resorts in Spain. Located on the coast of the Bay of Biscay, in northern Spain, it is surrounded by green hills, bays, rivers and mountains. The picturesque beach area ( La Concha ) attracts visitors from all walks of life on a global scale. Gastronomy is high on the agenda for visitors to San Sebastian as it boasts the highest number of Michelin starred restaurants in one city. There is an abundance of delicious tapas bars that will quench your appetite for those tasty little food plates. 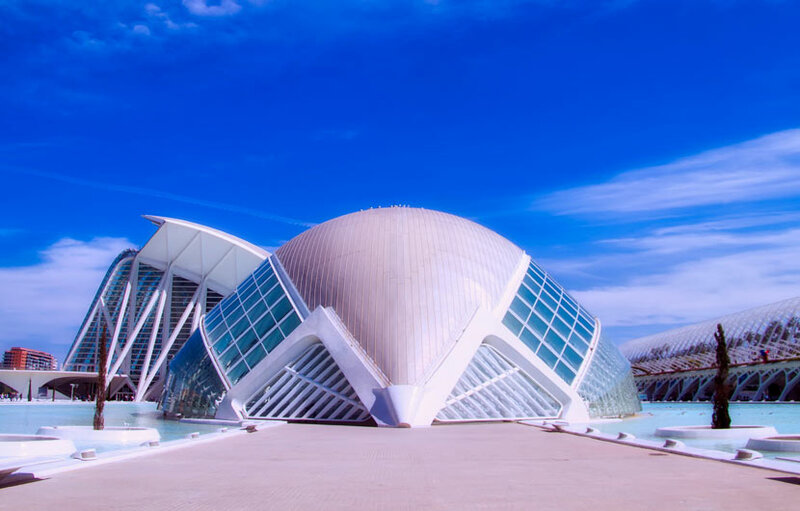 Stylish architecture, impressive plazas and green parks dotted throughout the city adds to its well-deserved label as the “pearl” of the North of Spain. 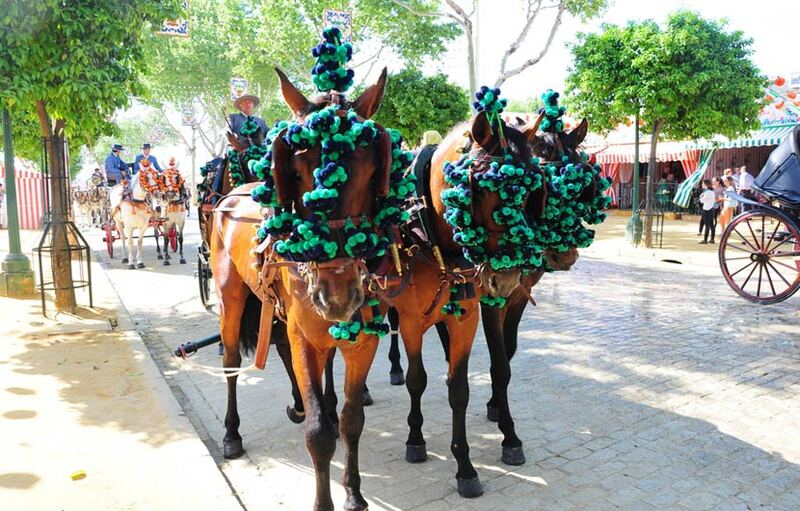 The Jerez Horse Fair (Feria de Caballo) is traditionally held during the first week in May and is a must visit even if you are not a lover of finely tuned thoroughbred Anndalucian stallions. This colorful festival is mainly located around the Gonzalo Hontoria Fairgrounds, an area which is well over 50.000 square meters in size, although during the weeks festivities special events are held all around the city. You are never far away from a flamenco show, a great tapas bar or any number of attractions open to the public during the horse fare. Jerez in itself is a charming Andalucian city home of the world renowned sherry wine and a great place to explore. The April Fair in Seville is one the grandest and oldest festivals in Spain, held for two weeks after the Easter celebrations each year, it now attracts over a million people a year. The fair began back in 1947 as a cattle fair and over the years took on a more typical Spanish festival feel as we know them today. The Seville Fair starts officially on the Monday with the Dining of Fish ( “La cena del pescaito”), and the parade in which the city mayor is present to switch on the lights around midnight. This act is usually accompanied by a spectacular firework display which booms out across the city announcing that the fair is officially underway. Apart from the fun, shows, drinking, partying and general merriment, the Seville fair has become a true celebration of flamenco dancing and traditional folk singing. Many of the most famous dancers , composers and singers of this passionate art form perform at numerous events during the fair. 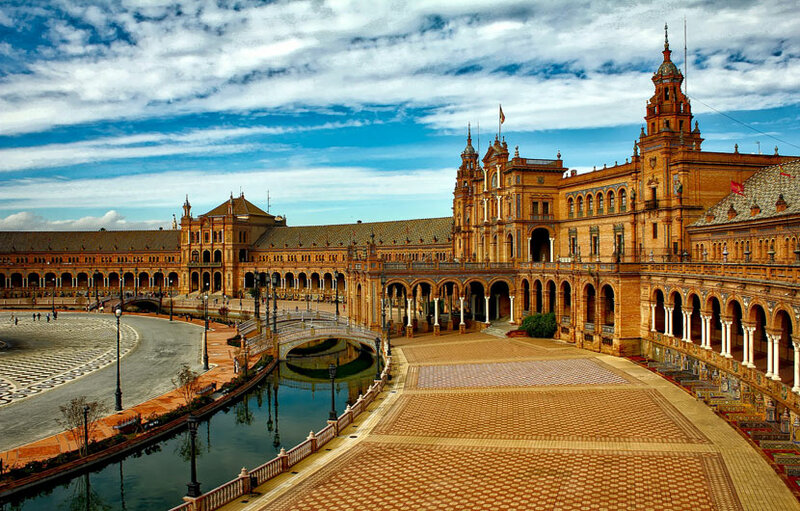 Seville is located in southern Spain and is the capital city of the autonomous region of Andalucia. Here you will find everything that is great about this charming region of Spain, its authentic culture, stunning historic sites, great food as well as boasting friendly fun loving residents. “Seville,” wrote Byron, “is a pleasant city, famous for oranges and women.” Whilst this is very true, its just the tip of the iceberg as Seville has become one of the most visited cities in Spain due to its rich history, cosmopolitan atmosphere, and its enviable location around the River Guadalquivir. Seville is home to some of the finest monuments and ancient sites in Spain, including the impressive cathedral, the rambling Alcazar gardens, the riverside Torre del Oro (Golden Tower), the banks of the Guadalquivir River, the Almohad walls, La Giralda and the famous La Maestranza bullring, the oldest of its kind in the world. The Camino de Santiago is really a collection of old pilgrimage routes, all of which have one thing in common, their destination, Santiago de Compostela. This unique pilgrimage was named after the Apostle Saint James who was sent by the Romans, in those days to “Finis Terrae”, “end of the world”, to preach and convert people to Christianity. The way of Saint James has been an important Christian pilgrimage route since medieval times being in use for over 1000 years. You dont have to have any religious beliefs to enjoy the atmosphere and beauty in participating in this world renowned walk. The Sierra Nevada mountain range is home to one of the most popular ski and winter resorts in Spain and the only one based in Andalucia southern Spain. Sierra Nevada nestles high in the Pentibetico mountain range some 32 kilometers from the charming and historic city of Granada. If you are thinking of skiing in Sierra Nevada you wont be disappointed as the resort offers great facilities for all winter sport enthusiasts and provides a good selection of ski lifts and quality slopes for all levels of skiers. It also has an excellent cross country track. It is also true you can snow in the morning and spend the afternoon tanning yourself on a sun kissed beach as some of the nicest beach resorts of Granada, Almeria and Malaga are only a stones throw away. Salamanca is located around a 90 minute drive north west of Madrid and is home to the Plaza Mayor, one of the largest public squares in Spain. This famous plaza is used as a meeting point, market place and even a bullfighting arena in the past. The Plaza Mayor is an awe inspiring site surrounded by ornate columned archways. The impressive offices of the town hall is also located within the square and has two stories of balconies above the archways below. The city of Salamanca is well worth visiting, renowned for its charm, known as the intellectual center of Spain since the 12th century when the first University was created. The Malaga feria is now one the largest Spain festivals attracting over 2 Million visitors each year. The festival rages all day and night on a large purpose built park located close to the exhibition centre just 15 minutes from Malaga International airport. The Feria de Malaga is usually held during the middle of August each year and features live entertainment, traditional music shows, dancing, horses, fireworks and daily processions around the city centre. Although the main party is held on Feria ground on the outskirts of the city we would highly recommend you visit all the events held around the Malaga old quarter where you can enjoy the amazing atmosphere whilst strolling around the decorated streets of central Malaga. 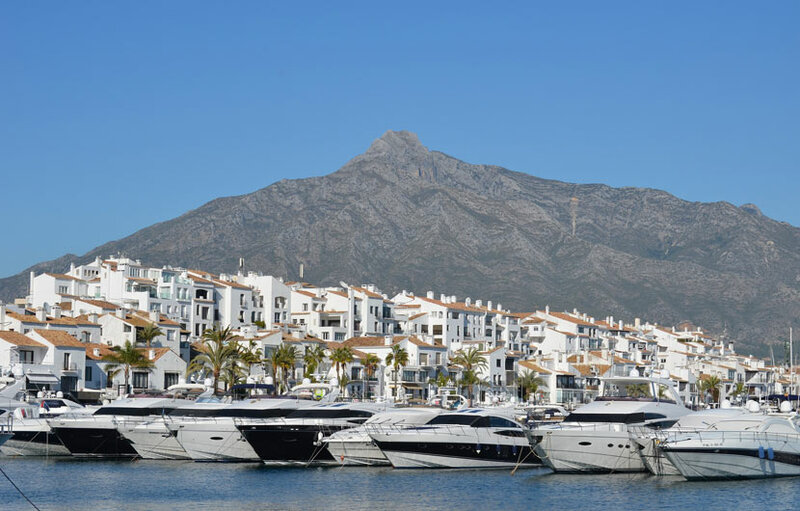 Well known as the playground for the rich and famous, Marbella has a cosmopolitan vibe located alongside the beautiful Mediterranean Sea of the Costa del Sol. 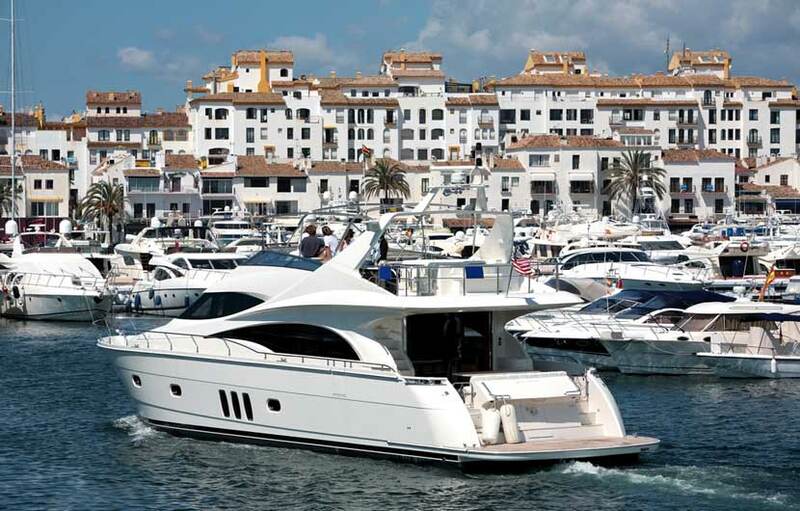 The stunning Puerto Banus Marina is home to more then enough multi million pound yachts and expensive cars to leave you open mouthed. The Marina is also home to world-class restaurants, luxury hotels, fashionable boutiques and vibrant clubs. This is where beautiful celebrities are entertained as they lounge beach side or on their high end yachts where expensive champagne flows everywhere. Marbella is where jet setters come to show off their wealth and they do it very well. However you dont have to be a millionaire to enjoy the atmosphere that eludes quayside. Logrono is located in northern Spain and is the capital of the famous wine making region of La Rioja. Take a walk around the old town and you will be transported back in time. Its sad that so many visitors to Spain overlook such gems as Logrono, pronounced Lo-Gron-Yo. The old town is a paradise for lovers of that great staple, tapas. There are well over 50 tapas bars within a small area, no wonder this was one of Hemmingways favourite eating haunts. Logrono is also a stop over for the pilgrims en-route to Santiago de Compostela. Apart from the delicious food, top attractions to see in Logrono include the Cathedral of Santa Maria de la Redonda, the Cubo del Revellin fort, the old city wall and walking along the River Ebro Park to an arched stone bridge. 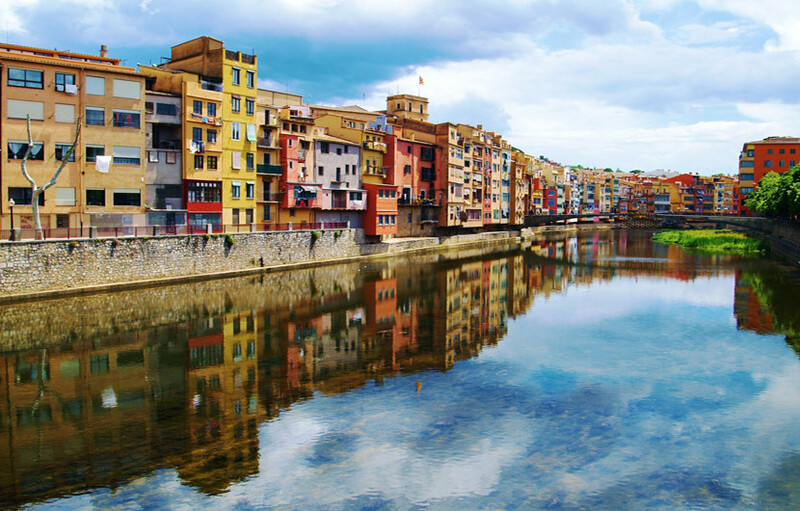 Girona is a beautiful ancient town located about one hours drive north of Barcelona. Sadly it is another charming Spanish city that is often overlooked by holiday makers and passing travelers flying into the local airport on their way to the nearby popular beach resorts of Lloret de Mar or Calella. The beautiful walled city features the River Onyar running through its core, with picturesque, multi-coloured hanging houses which virtually touch the water below. Girona is a homely medieval city of medium size (just perfect!). It is clean, vibrant, charming and cosmopolitan, and a real escape from the bustling Costas. A summer’s evening stroll from one end of the old quarter to the other is highly recommended – you get a real sense of the local culture and history. Explore the maze of narrow streets, passageways and celebrated monuments before stopping off at one of the many cozy eateries, tapas bars, terraced restaurants and cafeterias that are present throughout old city. Jerez de la Frontera is a charming historic city located in the heart of Andalucia nestled between the great cities of Seville ,Cadiz and Huelva. It is famously the home of Sherry, there are no less than nine major sherry bodegas in Jerez, most of them open to visitors. Wine tasting is popular in Jerez and a number of bodegas offer the perfect chance to explore the history of wine-making, its production and most importantly, the chance to try a selection of sherry from the very place it originated in. 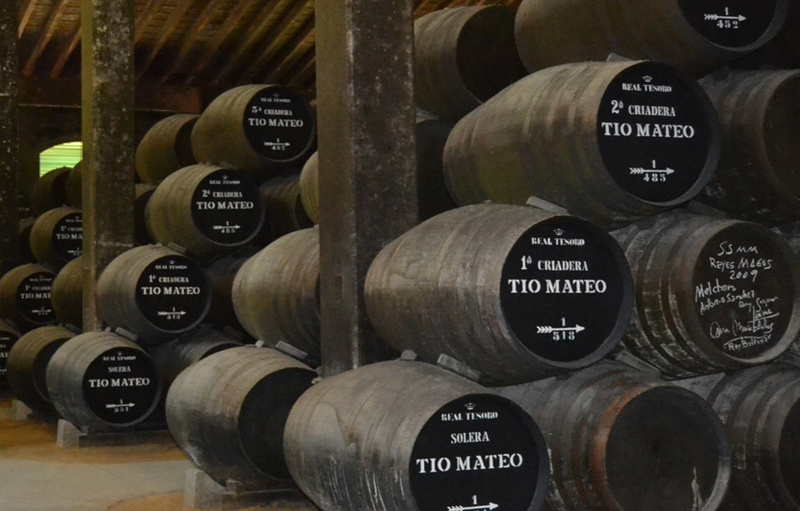 The local wine and sherry produced in Jerez, plays an important economic and social role all around the world. Sherry is unique, made from palomino grapes growing on calcareous soil within a specific local bio-climate. It is then left to age in oak barrels where old sherry is mixed with the new one to create the various types of this famous tipple. Among the best bodegas in Jerez de la Frontera include Domecq, Garvey, Harveys and Tio Pepe. Another famous bodega is Bodega Gonzalez Byass, near Alcazar, where you will see a construction designed by Gustave Eiffel (Eiffel Tower architect) and lots of barrels signed by personalities such as Orson Welles and Winston Churchill. Sherry tours are extremely popular and offer a unique view of the sherry making business from grape to bottle, you will even enjoy a free glass or two of this famous wine after each the tour is over. The Costa del la Luz ( Coast of Light ) is the southern most coastline of mainland Spain and can proudly boast having some of the best beaches in Spain. 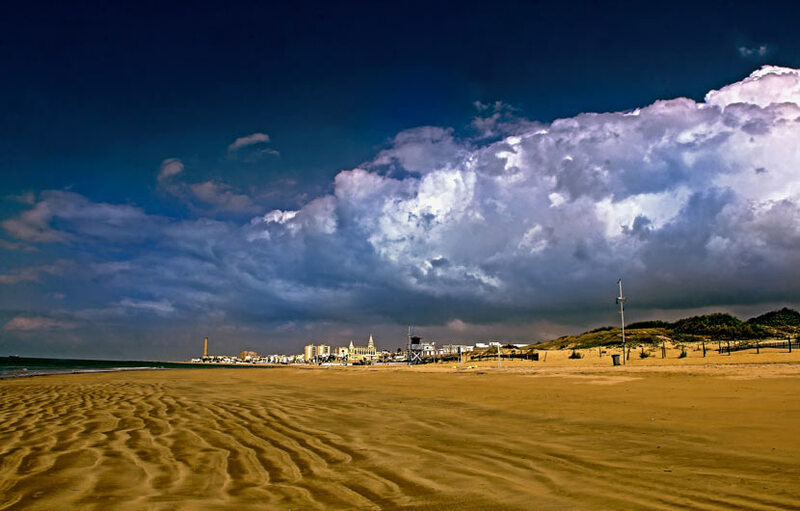 The beaches along the Costa de la Luz are blessed with high quality sand and clean Atlantic waters. The coast runs from Tarifa ( wind surfers paradise ) in the east to the Taguas estuary bordering Portugal in the west. Fantastic clean beaches, pine clad countryside, picturesque fishing villages and tranquil surroundings are some of the many attractions that attract visitors to this picturesque part of Spain. Galicia is a green and picturesque region located on the north west corner of Spain. Apart from the stunning beaches, crystal clear waters, quaint villages and old stoned buildings, Galicia is home to some of the finest and freshest seafood you will find anywhere. From the clear blue fertile waters which surround the coastal areas to the inlet rivers ( rias baixas ) fish and seafood is caught or harvested daily and sent packing to every corner of the country and overseas. 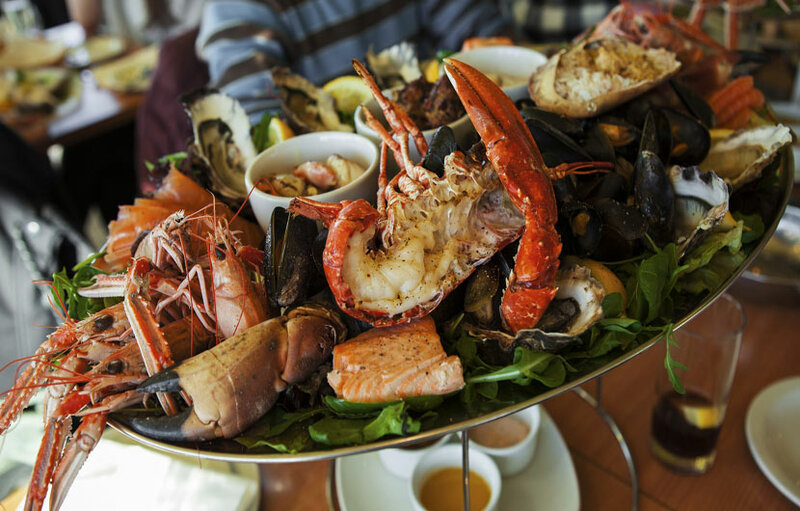 The most popular seafood include the spider crab, mussels, lobsters, cockles, clams, octopus, goose-neck barnacles, velvet crabs, razor clams and shrimp. 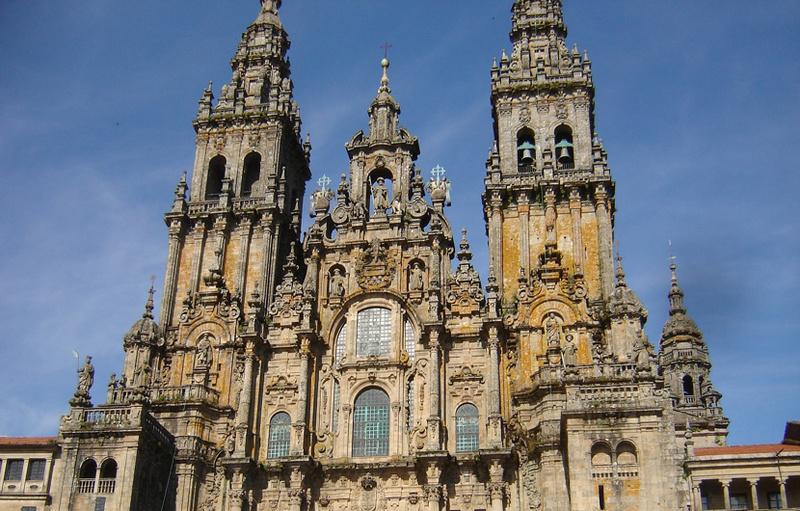 The cathedral is located in the region of Galicia in the northwest of Spain and is home to the Santiago de Compostela Cathedral, one of the most imposing structures of its kind in Spain. 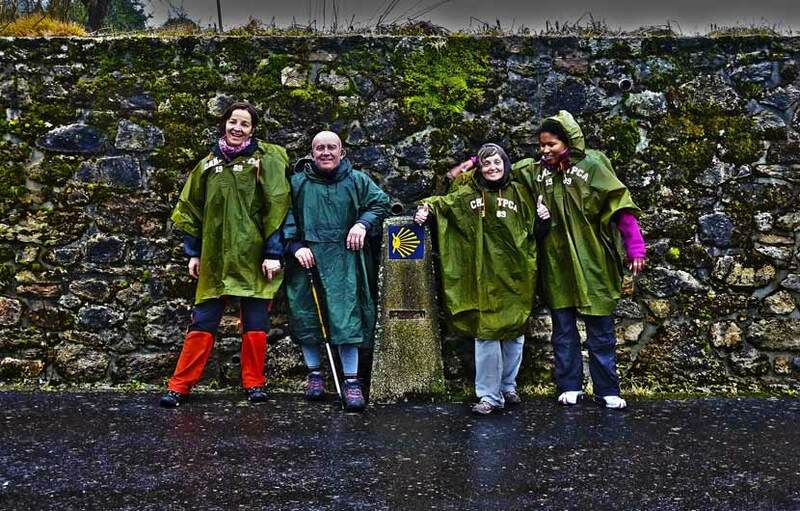 Its significance is enormous as it marks the end of the famous Camino de Santiago for many thousands of pilgrims each year. Construction of the Cathedral began in 1075 under the direction of Bishop Pelaez on the site of an old church dedicated to St James. It was built in various styles over the many years it took to complete including Gothic, Baroque, Romanesque and Neoclassical. Various entrance fee options are available, the guided roof tour costs €12, access to the museum is €6, a guided tour of the cathedral is €10 and a combined tour ticket is €15 per person. A reduced rate is available for certain groups and children under 12 years of age enter for free. The charming Andalucian city of Cordoba is most famous for the impressive La Mezquita Arab Palace located in the heart of the city. The great Arab Mosque which dates back to 784 A.D, becoming a World Heritage site in 1984. Cordoba was founded by the Romans in the 2nd Century and became on the most important cities under the rule of emperor Augustus, the cities great era though came in the 8th century when it was conquered by the Moors. Apart from the Great Mosque Cordoba is full of interesting places to visit including the famous decorated garden patios, the Zoco craft market, Casa Andalusi, the Jewish quarter, the banks of the Guadalquivir River and the many small eateries to enjoy delicious local tapas. February is carnival time in Spain and the pick of bunch must surely be the Carnivals of Tenerife and Cadiz. 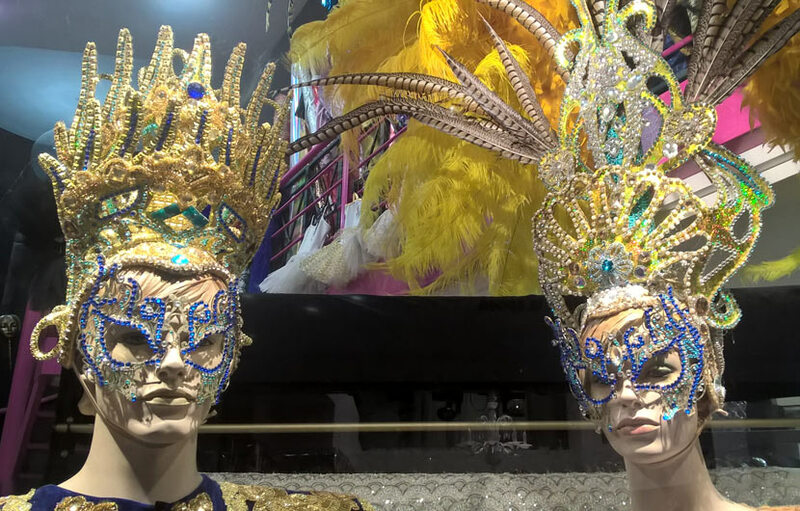 The Tenerife carnival resembles those held in Brazil and features parades with floats and bands who perform different types of songs during the street parades. The colours and costumes worn during this festival are stunning and are a delight to see. The parades move through the streets with energetic musical groups and well-dressed performers. Some of the colourful costumes can weigh well over 100 kilos, taking months to prepare and make as well as the many hours practice required to be able to move in such a huge costume. Whilst Cadiz boasts the oldest carnival celebrations in Spain, dating back to the 16th century. Always a colourful spectacle with lots of processions, band playing, group singing, fireworks and much more. The La Tomatina festival surely has to be one of the most fun and messy of all Spain’s festivals. Basically it is the worlds largest tomato fight held on the last Wednesday of August each year in the town of Bunol in the region of Valencia. This is where hundreds of tons of overripe tomatoes are thrown in the streets by thousands of festival goers. It is a tomato war using ripe squashed tomatoes hurled between participants leaving everyone dripping with bright red sweet smelling tomato juice. There are no winners just people having fun and enjoying being part of this unusual Spanish festival. Valencia is one of the largest cities located on the mid western Eastern coast of mainland Spain. The impressive City of Arts and Science is an entertainment based cultural and architectural complex that will keep you occupied for days on end. There is a fascinating Aquarium which houses the largest marine and aquarium park in the Europe. An Oceanographic centre is situated mainly underground and houses a marshland, wetland areas and mangrove swamps. There is also a Dolphinarium, one of the largest in Europe with a seating capacity for over 2.000 people and holds around 23 million litres of water !. The City of Arts and Science is open most days and entrance to the various attractions start at around 8€ per person. Even if you are not a fan of good wine, a trip around the Rioja region is highly recommended. La Rioja is located in the picturesque north of Spain and is spread out over three communities, La Rioja, the Basque country and Navara. There are a number of wineries who regularly open their doors to the public so a planned wine tour is the best way to see how these world class wines are harvested and made. Visitors to the region are treated to a number of amazing wine museums, breath-taking landscapes, ancient monuments and fantastic hotels. 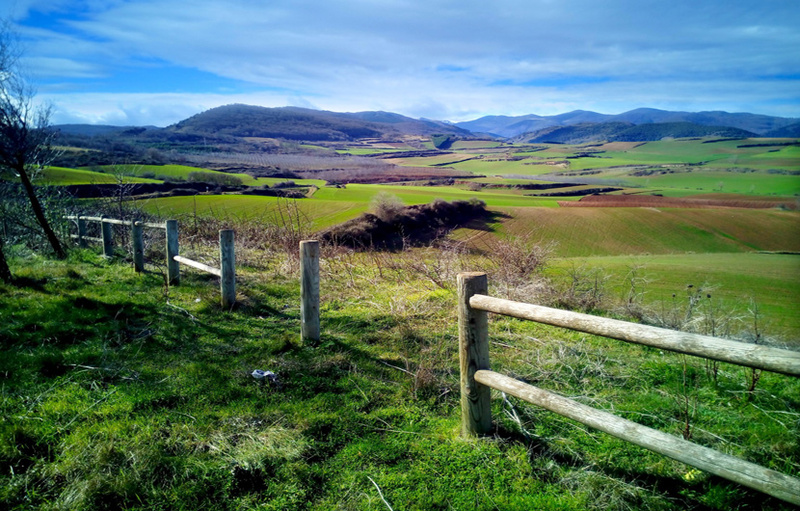 Travelers to La Rioja region rarely leave disappointed. The Principality of Asturias, known for its rugged coast, is located in the north of mainland Spain. Renowned for being one of the most picturesque, green and fertile lands in Spain. Asturias boasts a stunning coastline, mountains, beautiful beaches, quaint coastal villages and a range of religious sites and medieval architecture. 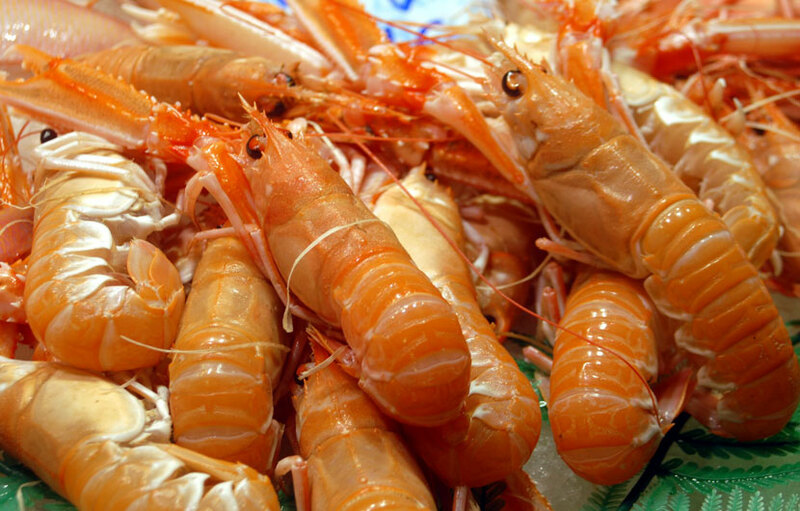 Asturias is also home to some of the best seafood gastronomy you will find anywhere. Top attractions include the Molinos museum at Taramundi, Cape Vido , Lake Covadonga and the Santuario de la Virgen de Covadonga located in Cangas de Onis. Santillana del Mar is a charming town located within the Cantabria region of northern Spain. 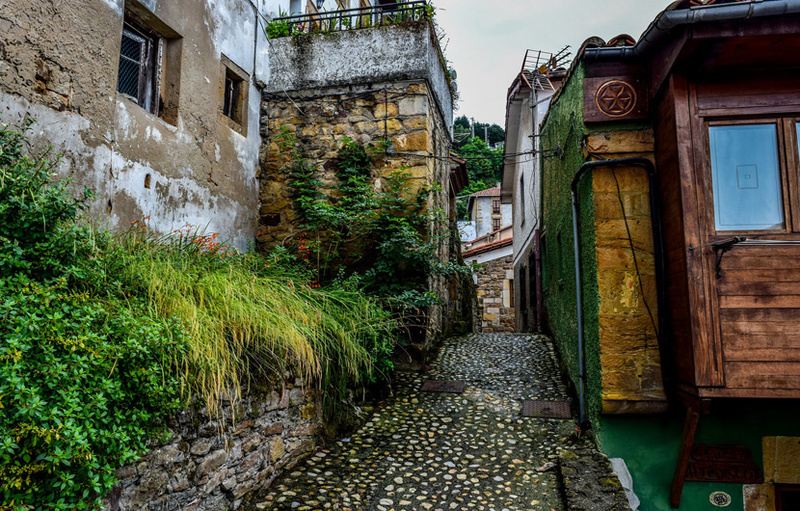 This quaint and picturesque village is a must place to visit if you plan to travel explore northern Spain. The towns real beauty will become quickly apparent as you walk around the cobbled lanes looking around at the historic mansions, sandstone churches and the captivating surrounding hillside. The top attractions in the town include medieval towers, renaissance palaces, the Romanesque Santa Juliana Collegiate Church, the National Museum and Research Center of Altamira. There is also a zoo which houses snow leopards and tigers, amongst other animals. 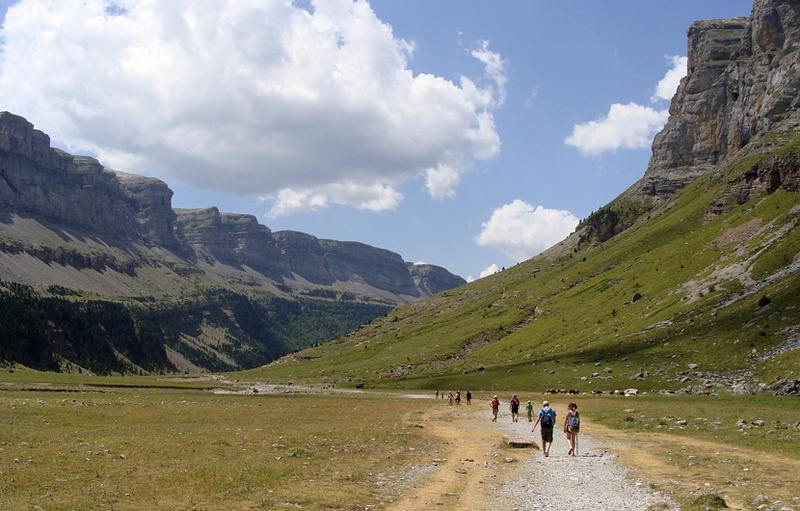 The province of Huesca is another must visit region located in north eastern Spain. The regional capital is Huesca situated in upper Aragon and known for its picturesque medieval old town topped by the stunning Gothic Huesca Cathedral. The city was the capital of Aragon until 1118 when Zaragoza took over the title. Visitors to Huesca are treated to charming streets, mountain landscapes and the backdrop of the Pyrenees. Top attractions include Huesca Cathedral, the San Pedro el Viejo Abbey Romanesque monastery and the 11th century ruins of Montearagon Castle. 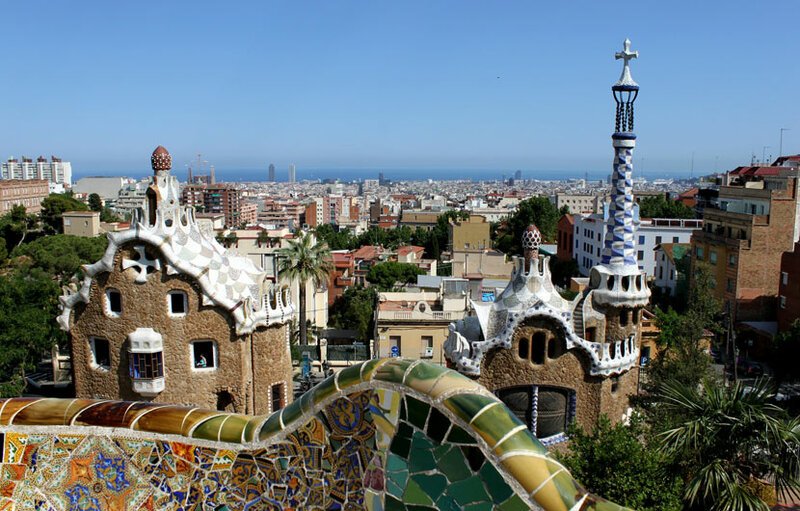 No trip to Barcelona would be complete without visiting Parc Guell, one of the most unusual social spaces in the world. 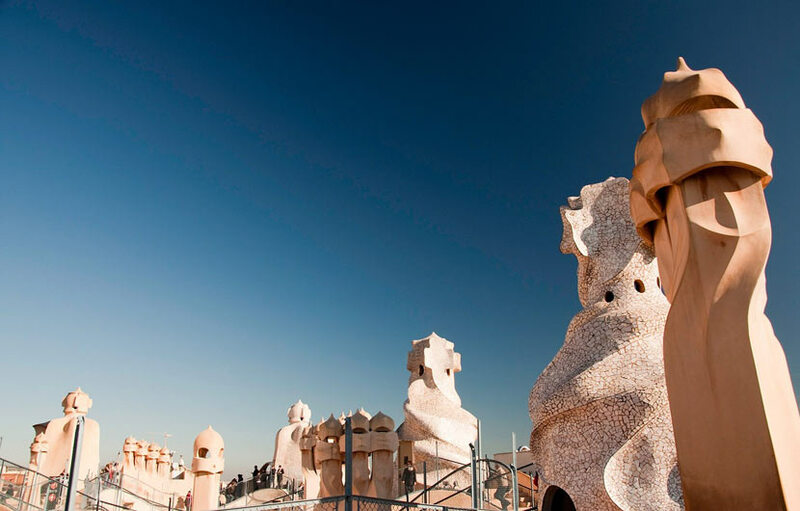 This is another one of Gaudi’s unusual creations, this one located in the northern part of the city. Sculptures, mosaics and tiling are all on show in this picturesque and leafy park which was cleverly created by Gaudi and built on land high above Barcelona which gives visitors superb views over the city. It is an odd but enchanting place that will stimulate your senses. It is always good to book your visit in advance as they only allow a certain number of visitors in every hour. Casa Mila popularly known as La Pedrera ( The Stone Quarry ) is another ingenious creation of Antoni Gaudi not to be missed when visiting Barcelona. It’s facade resembles an open quarry and was built by Antoni Guadi between 1906 and 1912. This is the last building created by this unique artist before he devoted his life to the construction of the Sagrada Familia. Casa Mila is located in the Eixample district of Barcelona and is surely one of the worlds most recognised modernism structures. It is best to book admission online to avoid the often long queues. Entrance fees vary as they offer a variety of tour experiences. La Pedrera by day is the most popular at €22 which includes an audio guide. A combined La Pedrera tour day and night costs €41 but well worth it. 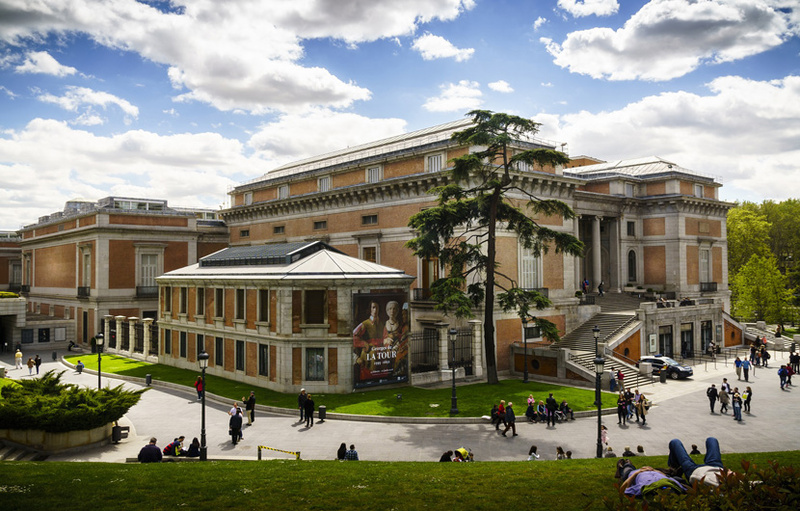 The Prado museum is located in the central Madrid as is recognised as home to one of the finest collections of European art dating between the 12th and early 20th centuries. Here you will find works of art by the great masters including Goya, Rubens, Velazquez and El Greco. The museum currently houses around 8.000 drawings, 7,500 paintings and almost 5.000 prints. This is a must place to visit if you plan a trip to Madrid. The Museum is open most days from 10am to 8pm, and if you are on a tight budget you can get free entry between 6pm and 8pm daily. If you like visiting truly authentic historic cities and towns then the medieval city of Cuenca is the place for you. Located in the mountains of east-central Spain, Cuenca was founded by the Moors and is a World Heritage Site. Walking around the old quarter you will be treated to a walled town with steep cobbled streets and medieval castle ruins. Cuenca is perched on a limestone rock overlooking the Jucar ana Huecar rivers and is best known for its “casas colgadas” or hanging houses which seem to miraculously cling to the cliff edges. If your ideal summer vacation consists of late-night partying and dancing till dawn followed by long, lazy days in the sun sleeping off the chaos and drama of night before, then the Ibiza summer nightlife is the prefect destination for you. The night-life is intense and non-stop, the weather is simply glorious and the sun, sea and sand top it off as the ultimate holiday party island. Ibiza offers some of the greatest clubbing experiences in the world which attracts some of the best DJs and artists on the clubbing circuit. Every summer sees an awesome array of celebs and well-known names hit the party scene, making Ibiza an absolute MUST for clubbers, ravers and those looking to party hard! The Pyrenees rises like an immense barrier that separates Spain from the rest of Europe. It stretches for around 450 kilometers from the Cantabrian Sea to the Mediterranean in northern Catalonia. Some its peaks are around 3000 meters in height and is home to some of the most stunning scenery in Spain, with long green valleys, quaint towns and villages scattered the whole length and breath of this beautiful region. Spain has become a golfers paradise offering over 450 top class golf courses and an enviable climate with long hours or sunshine which allows valuable golf time late into the evening. Golf courses are located throughout mainland Spain and the Balearic and Canary Islands. One of the most popular areas for golf holidays in Spain is the stunning Costa del Sol which boasts 70 top class courses alone including such prestigious golf resorts as Valderrama Golf, San Roque Club and the ever impressive La Reserva Golf Club. The current number one golf course in Spain is the stunning PGA Catalunya course located in the heart of Catalonia just a 50 minute drive from Barcelona. A real hidden gem in southern Spain are the Rio Tinto mines, located around the Village of Nieblas within the region of Huelva Andalucia. The name Rio Tinto ( Red River ) was coined from the impressive colour of the water that flows through the mines. When the ferrous ores come into contact with water they turn both land and the river into an incredible myriad of colours, shades of red, yellow, orange, brown and green can all be seen as the river trickles through the area. The mines are reputedly the oldest in the world and rich in history, reportedly being the fabled mines of King Solomon himself. It was sold to a British consortium in 1871, who exploited until it became one of the most important sources of Copper and Sulphur in the world. The colonials even built a small village called Bella Vista for the employees of the mines which is identical to any perfect little country retreat in Britain with neat lawns gardens, tennis lawns and a social club, it even has its own and Presbyterian Church. The mines are well maintained and can be visited to this day and for a few Euros you get to go on a guided tour in an old converted train. The Alpujarras national park is located on the southern flanks of the Sierra Nevada mountain range in Granada, Andalucia. For nature lovers this is an ideal destination with its wide open spaces, spectacular views and quaint white-washed villages. 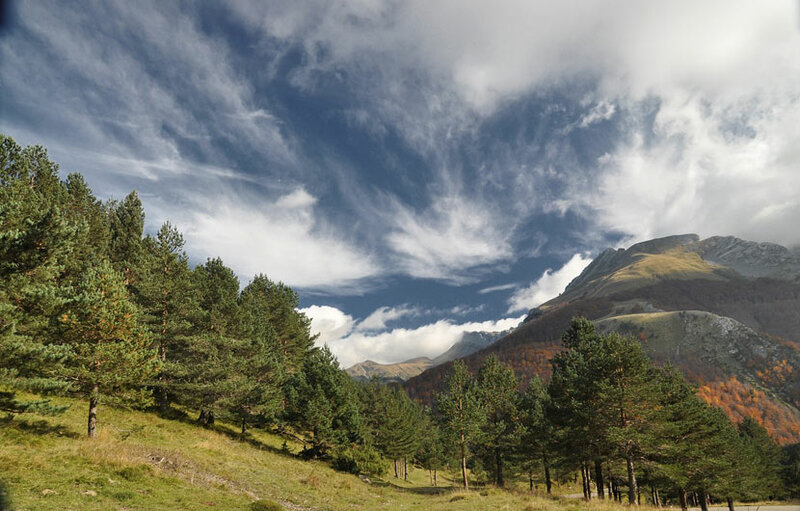 The Alpujarras National Park is a vast open space which stretches from Granada to the neighbouring province of Almeria. During the winter months you are treated to a snowy peaked backdrop courtesy of the Sierra Nevada mountains. Trecking, horse riding and cycling are just some of the activities which attract visitors to the precious natural park. 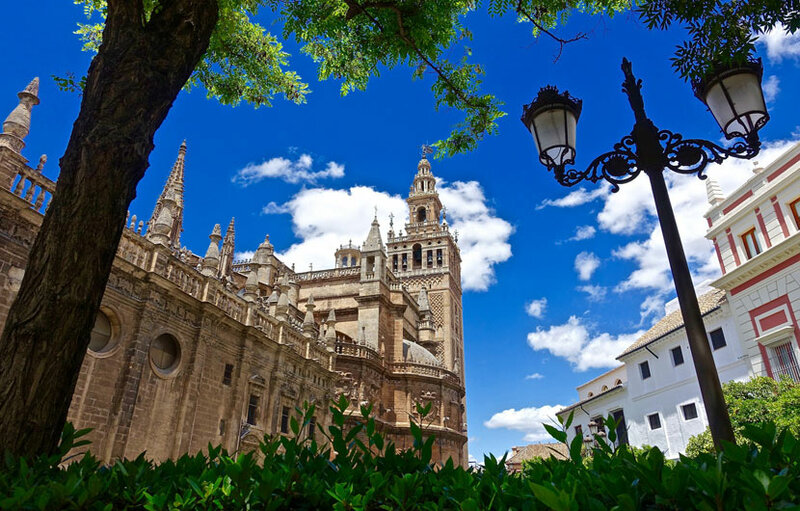 Seville is a great place to visit almost anytime of the year and one of its star attractions is the Santa Maria de la Sede cathedral, the largest Gothic cathedral in the world and recognised as a World Heritage site by UNESCO. Seville Cathedral is an imposing site, located in the heart of the city just a few minutes walk from the Guadalquivir River. The construction lasted for well over a century, the idea of cities elders at the time was to “ to build the grandest and most magnificent Cathedral that people will think us mad”. The stunning central Nave rises well over 40 meters and is flanked by 80 side chapels. The Basilica was built on the site of the Aljama mosque from the Moorish dynasty which dates back to the 12th century. The Plaza Mayor is a hug square located in central Madrid and is a popular meeting point for locals and visitors alike. Originally called the Plaza del Arrabal it later changed its name to Plaza Mayor and is a stones throw away from another famous square, namely the Puerta del Sol. 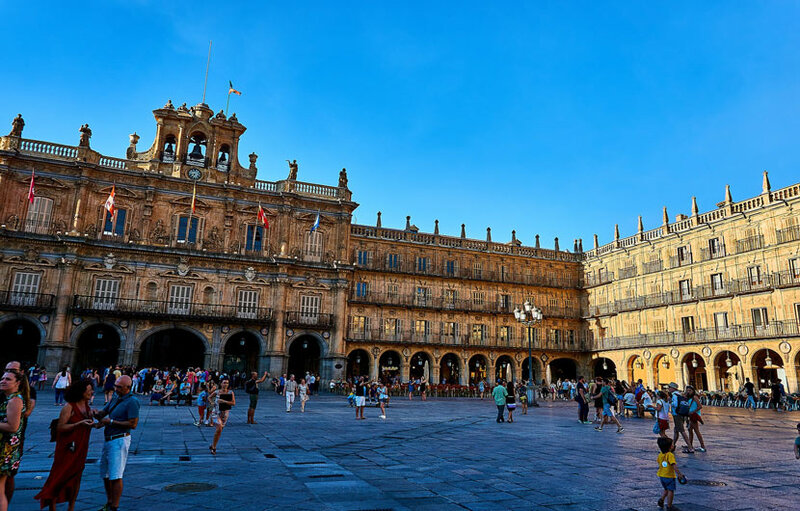 The Plaza Mayor design has symmetrical and uniformed architectural style surrounded by 237 balconies, nine entrance ways, a bronze statue of King Phillip III and ornate gardens. No visit to Madrid would not be complete without a trip to the Plaza Mayor where visitors are treated to a unique atmosphere, some great little eateries and some fine architecture. Not to be missed on your next trip to Spain’s capital. Las Ramblas is probably one of the first places visitors to Barcelona head too as it is the most easily identified landmark in the city. Las Ramblas is a long boulevard which cuts through central Barcelona. It is a lively, vibrant place full of market stalls, locals, street musicians, and lined by a large variety of bars and restaurants. The boulevard starts near the Port Vell cruise ship terminal and ends at the famous Placa Catalunya at the most northern end and is sandwiched between the Ravel and Gothic Quarter of the city. The city of Toledo is surrounded by the meandering Tajo River and is truly a beautiful sight, especially at night when its twinkling lights and beautifully lit buildings and monuments can be seen from afar. 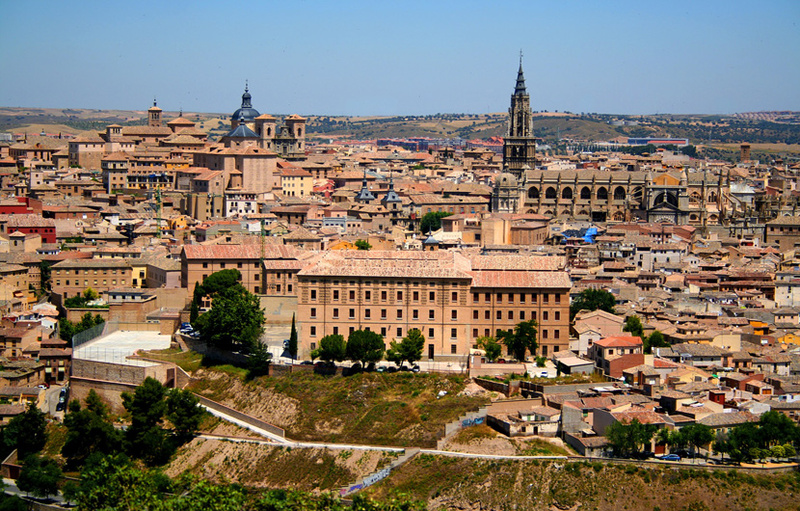 There is so much to see and visit in Toledo you will not be disappointed. 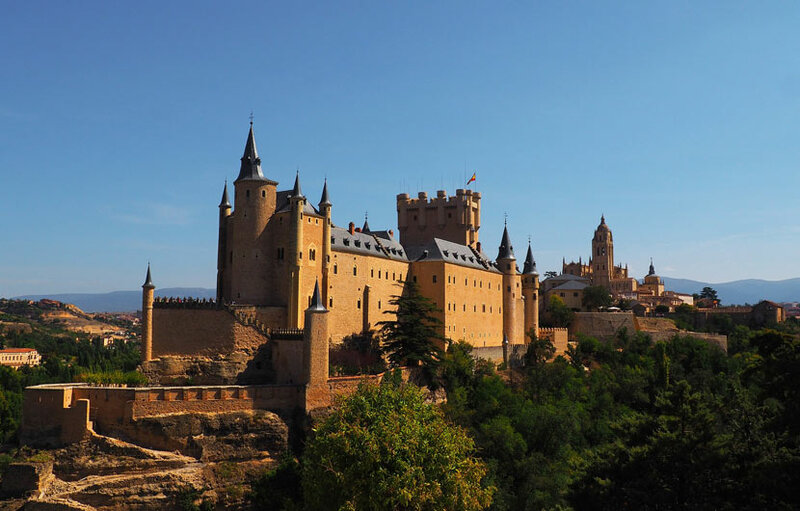 Popular sites and attraction in Toledo include the Alcazar, the great defenses wall, the El Greco Museum ,the Santa Domingo Monastery, the San Martin bridge with its two towers and the 15th Century San Juan de los Reyes Monastery. Avila is a beautifully historic city much of it within its perfectly preserved medieval city walls, which are typical of the city’s predominant Romanesque architecture. Avila’s proximity to Madrid (about an hour’s drive away) makes it an ideal destination for those who yearn to taste the traditional, unchanged Spain, while avoiding the bustle of the big city. 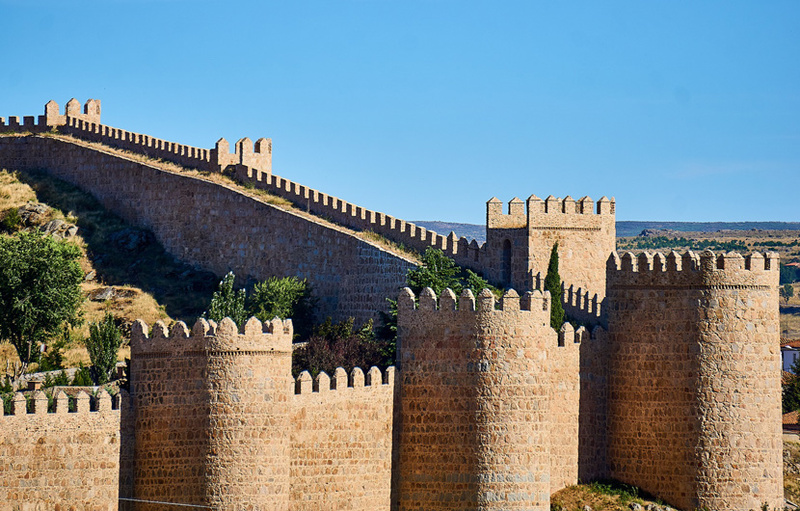 Avila within-the-walls has remained mostly unchanged since centuries ago; the atmosphere is solemn and tranquil, just as if you had gone back in time to medieval Spain. The city has a wealth of monuments and other architectural sites of excellence, such as the cathedral, the mother of all of them, and several smaller churches and basilicas. Your first view of the city is, of course, of its majestic walls, started in 1100 and designated a UNESCO World Heritage Site – it is one of the few medieval cities in the world whose walls fully enclose the city within them; perfect for that panoramic holiday snap. The Donana National Park is located in Andalucia, Southern Spain halfway between the regional provinces of Seville, Cadiz and Huelva. A stunning natural park made up of one of Europe’s most important wetland areas, vast sand dunes and picturesque pine forests. The wetland lagoons provide shelter and food for thousands of birds. Donana is one of Spain’s prized national parks and for good reason. A myriad of landscapes captivate visitors who come to enjoy the large amount of wildlife, the pristine unspoilt beaches, the nature trails and the moving dune systems. Just a 30 minute drive form the busy Costa del Sol beach resorts in southern Spain you will find the stunning townronda of Ronda. Built on an isolated ridge of the Sierra Ronda, the town is split in half by a gaping river gorge, El Tajo, which drops a sheer 130 metres on three sides. 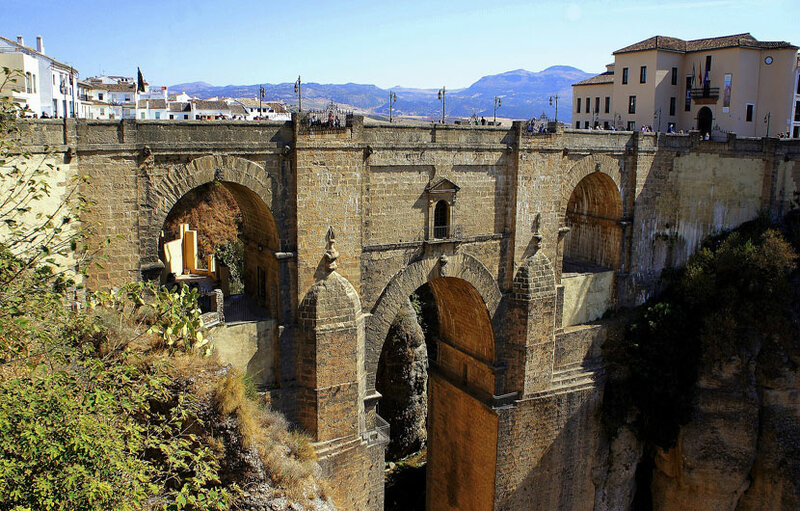 Still more spectacular, the gorge is spanned by a stupendous eighteenth-century arched bridge, the Puente Nuevo, while tall whitewashed houses lean from its precipitous edges. Much of the attraction of Ronda lies in this extraordinary view, or in walking down to the Rio Guadalquivir or following one of the donkey tracks through the rich green valley below. A must place visit if you plan to holiday anywhere near the Costa del Sol. 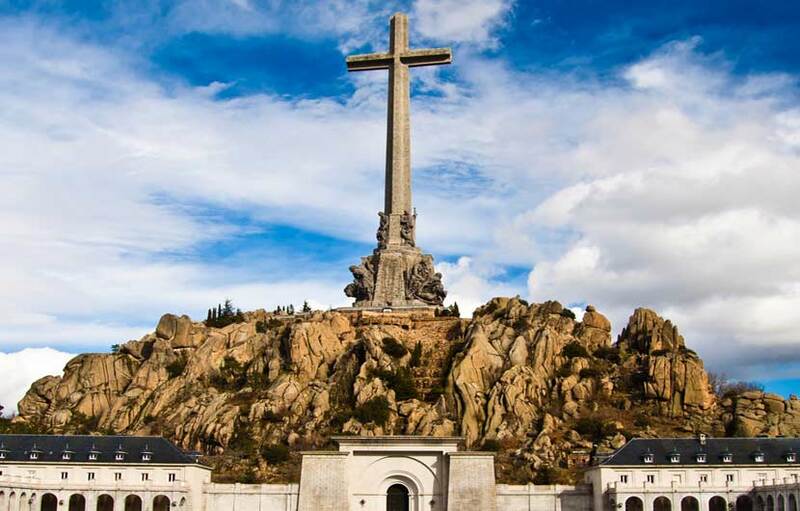 Located not far from Escorial Monastery this Monument and grounds are dedicated to the fallen from Spain’s civil war. Although not usually included on the travel itineraries of many visitors to Spain, the Valley of Fallen is well worth a visit. Slightly controversial as this is the burial place of General Franco, that aside the €9 entrance fee is worth it to get a taste of an an important part pf Spain’s history. If you plan to stay on the Costa del Sol you will be able to enjoy a selection of popular beach resorts located all along this famous stretch of coastline. Southern Spain’s Costa del Sol (Sun Coast) is one of the most popular travel destinations in Europe, the area is famous for hundreds of golden beaches and a perfect climate boasting over 300 sunshine days a year! The main resorts on the Costa del Sol include Fuengirola, Torremolinos, Benalmadena, and the luxury sun kissed resort of Marbella. A wonderful symbol of Spanish culture, Flamenco is something that many tourists look forward to when visiting the country. What’s great about this cultural attraction is that it can be watched the whole year round and practically anywhere. Flamenco is a type of Spanish music containing different elements including singing, dancing, hand clapping and Spanish acoustic guitar. You can probably recognise Flamenco immediately thanks to the long, outstanding dresses worn by the women dancers, typically in flamboyant colours of red and blue. The dance became so popular that it was declared one of the “Masterpieces of the Oral and Intangible Heritage of Humanity” by UNESCO in 2010. In fact, the dance is taught and practiced all over the world. There are many famous “Tabloa Flamenco” venues around Spain, some of the most popular include the Tablao Flamenco Cordobes in Barcelona, the Guitar Festival of Cordoba held in July, the Suma Flamenca Madrid and the Malaga Feria held in August each year. The region of Castilla y Leon is a land so plentiful of castles they even named the region after them, the Spanish word for castle is Castillo. So if your into wondering around historic sites then head to Penafiel, a stunning German Gothic style castle of impressive proportions. The castle is located in the province of Valladolid overlooking the picturesque Botijas and Duraton valleys. It is around 190 meters in length with one main central tower flanked by eight turrets. It was declared a national monument of great interest in 1917 and currently houses the Provincial Wine Museum. Luckily for visitors there is a tasting room where you are able to try some of the best of local wines. The Castle is open to the public Tuesday to Sunday and public holidays from 10.30am to 2pm and again 4pm to 6pm ( during the summer months it stays open until 8pm. The Royal Palace is a real hidden gem, often overlooked, which is a great shame as it is one of the best palaces of its type you will find anywhere in Spain. 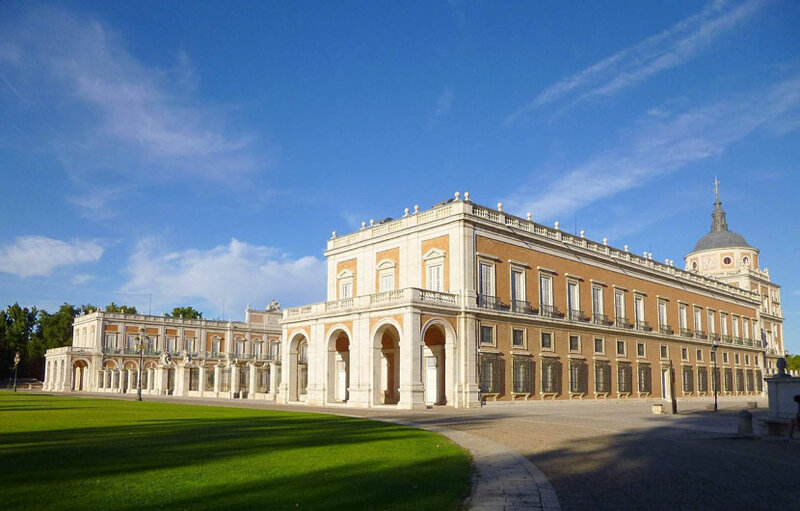 The town of Aranjuez is located within the province of Madrid and stands proudly besides the Tagus and Jaramar Rivers. This shining example of a royal palace was built in by Lorenzo Suarez de Figuero in 1387, it became royal property under Ferdinad II and claimed as a summer residence for the royal family. It is renowned for its well crafted gardens and ornate fountains. Many kings and queens have added their touch to the palace over the centuries including Phillip II, Philip V and Ferdinand VI. Public opening times are usually between 10.30am and 4.30pm, the entrance fee is reasonably priced for unguided tours at €8 for adults and just €4 for children and pensioners. Almodovar Castle is located in the town of Alomodvar del Rio within the province of Cordoba in the heart of Andalucia in southern Spain. 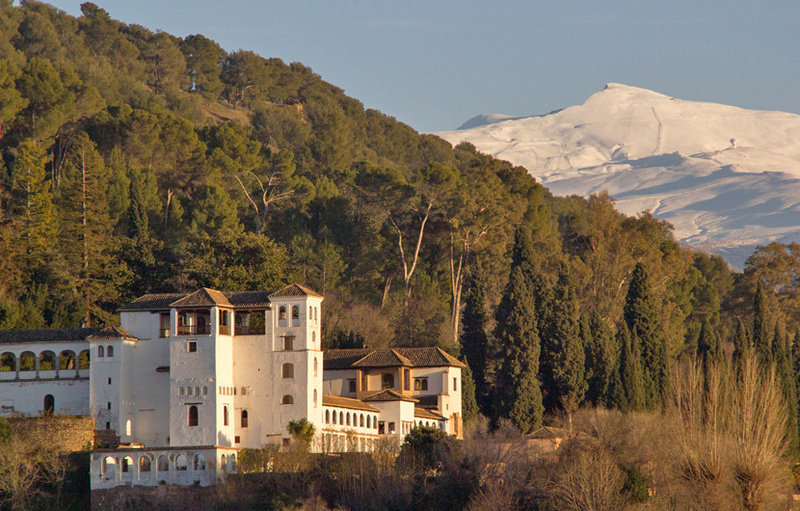 The castle is another hidden gem to be found in deepest Andalucia and well worth visiting at any time of the year. Famous for being used as the filming location for Game of Thrones where is was used as the ancestral home of Tyrell. The castle sits on a hill on the banks of the Guadalquivir River and date back to the 8th century when the Moors ruled Andalucia. The town and castle is within easy reach of Cordoba which has good rail links to Madrid, Seville and Malaga. Almodovar Castle is well worth visiting and is open to the public for guided and non guided tours which are very reasonably priced starting at €8 for adults, €6 for pensioners and €4 for children. Visitors can explore the patios, towers and battlements, there is also a nice medieval shop and reenactment tours and activities which are great fun for all the family. The Manzanares el Real Castillo is located some 50 kilometres from Madrid on the south side of the Guadarrama mountain range. Although at first glance the castle is not one the largest or grandest it is still well worth visiting if you find yourself staying close by. Originally built as a fortress it was turned into a residential palace by the Mendozas, one of the most noblest families in Castilla in the middle ages. The Castle La Mota is a well preserved medieval fortress located in the town of Medina del Campo within the province of Valladolid. Ideally situated on an hill, which is where is gets its name, Mota is Spanish for elevated hill. It dominates the local town and countryside with its impressive towers and battlements. The castle dates back to the 12th century, thankfully much of it still stands today. Over the years Castilla La Mota has been used as a military academy, a prison and a royal archive. La Manga de Mar Menor is located in the province of Murcia in south eastern Spain. Blessed by a unique position, La Manga is surrounded by sea on one side and a huge lagoon on the other. Due to a geographical accident of nature La Manga ( which means Sleeve in Spanish ) is a long strip of land which, bar a few connecting channels, is completely closed off the Mediterranean sea. A huge salt water lagoon was formed which is proudly protected from the rougher Mediterranean seas on the outside creating a calm interior bay. 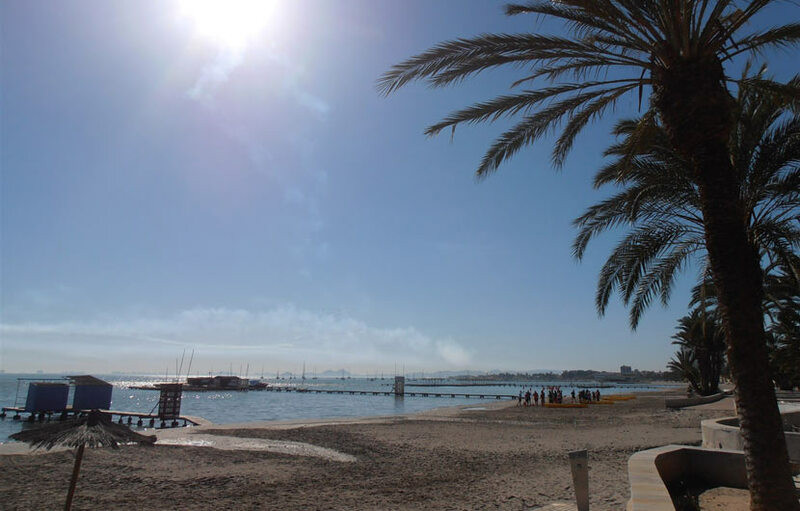 The Mar Menor is ideal for practicing many water sports in a calm and safe environment. There are plenty of beaches along the strip to enjoy plus numerous bars, restaurants and two marinas. The Iberian peninsular has been heavily influenced over the centuries by the Celtic culture and non more so then Galicia in north west Spain. Galicia offers visitors a friendly atmosphere and oldie worldly charm which is unique and endearing. Galicia is known in Spain as the “land of the 1000 rivers”, as they wind there way all over the region from the mountainous inland to the coast, where they form the characteristic “Rias”. The Celtic cuture is evident all around the province from the dark stone buildings to the use of bagpipes by many musical bands. 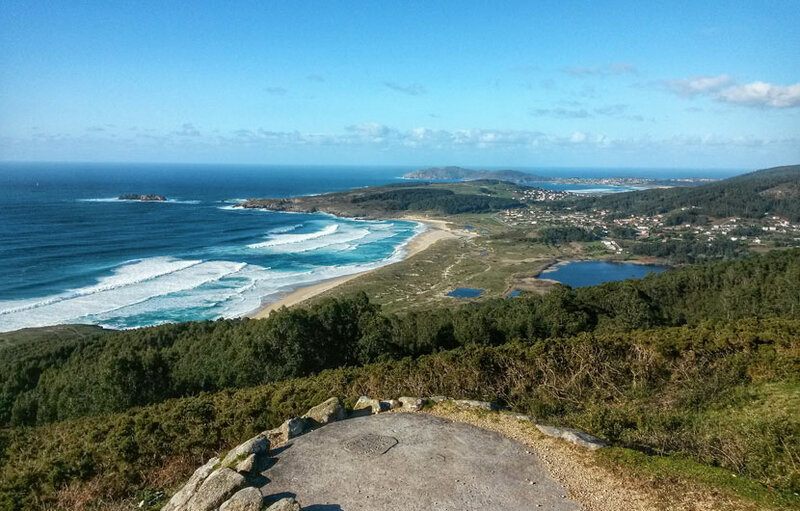 Travelling around Galicia is like a breath of fresh air with its green and fertile lands, spectacular coastline, picturesque villages and small quaint harbours. Bagpipes are a surprisingly key part of cultural life and hint at the region’s distinctive Celtic heritage. Galicians take pride in this identity, despite scepticism from their would-be cousins across the sea. Benidorm is situated in a privileged position on the Costa Blanca, just south of the other popular resorts of Altea and Javea and northeast of Alicante. It is jealously guarded by the Sierra de Aitana mountain range which protects it from the sometimes inclement cold north winds of winter providing a mild climate even through the colder months. Holidays to Benidorm are as popular as ever and the resort remains one of Spain’s top holiday hotspots. Tourism here developed in the 1960s and has long been a favorite destination by most northern Europeans ever since. Visitors to Benidorm can enjoy long safe sandy beaches, numerous water sports activities, lots of bars, restaurants and a vibrant nightlife. The dramatic landscapes of Andalucia have attracted throngs of interested visitors over the years with the white washed villages a major attraction to visitors searching for a unique view of Andalucia. Each of the villages locations are varied but each one offers a special charm and are well worth visiting. Popular villages include Alhama De Granada, Medina Sidonia, Lanjaron, Montefrio and Casares. 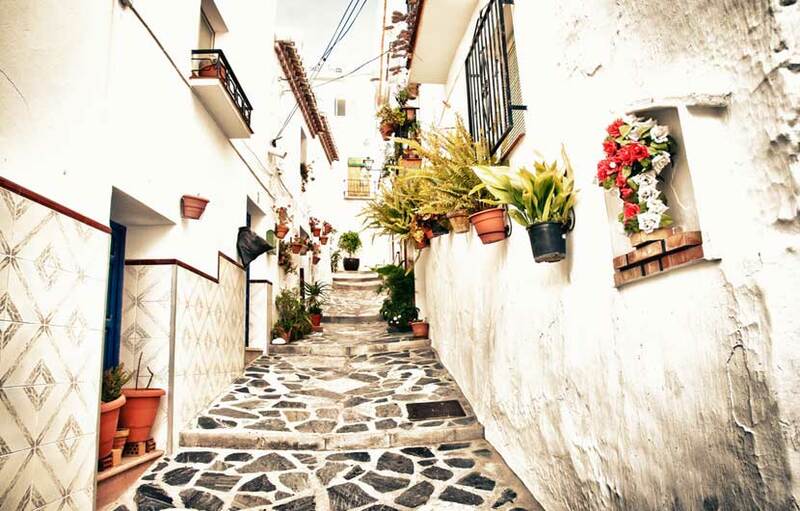 One of the most spectacular is the village of Lanjaron located on the foothills of the Sierra Nevada in Granada. The town is roughly 50 kilometres away from the city of Granada, and about the same from the Costa Tropical and the Mediterranean Sea to the south. Lanjaron is well-known in Spain due to the brand of mineral drinking water of the same name. The area around Lanjaron is noted for its abundant freshwater springs as well as its supreme natural beauty. A quirky fact – Lanjaron is one of the very few places in the world which prohibit death, yes its illegal to die in Lanjaron ! The Cabo de Gata National Park is located in the province of Almeria in Andalucia. The park is based around a huge Cape on the coast and extends out to sea. It is one of the very few Spanish coastlines that have remained untouched by large scale development. Because there are hardly any main resorts and inhabitants and the fact that all urban construction is highly regulated the sea quality is excellent and ideal for diving and snorkeling. 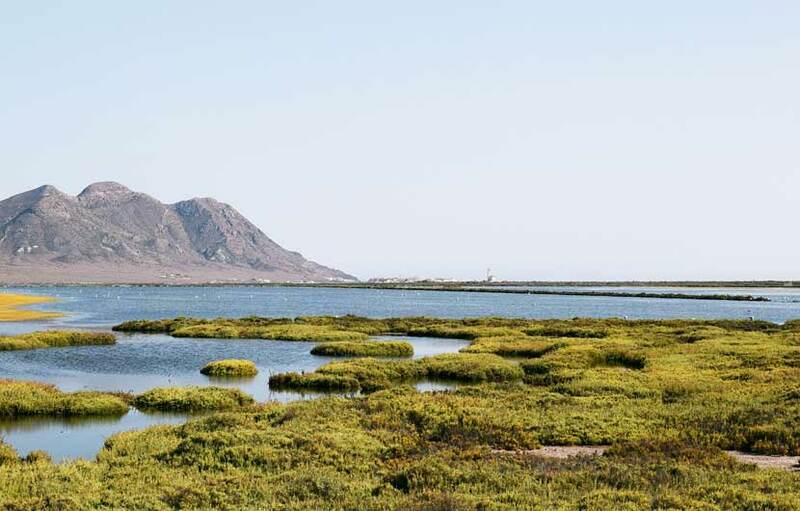 Lucky visitors to Cabo de Gata will find pristine beaches, crystal clean waters, tranquil coastlines and small quaint communities. The Pablo Picasso museum is located in the heart of Malaga and dedicated to one of Malaga’s most famous sons. 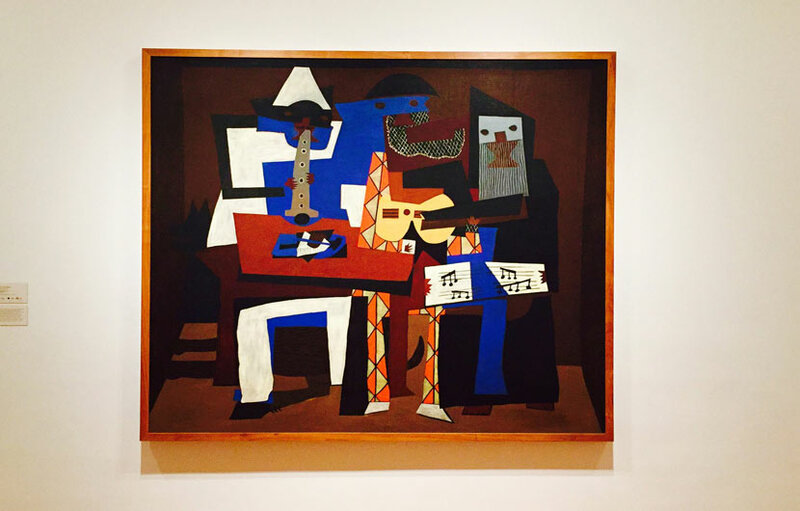 Pablo Picasso was born in Malaga later becoming one of the worlds most recognised artists. The museum opened in 2003 and houses around 280 works or art, donated by Picasso’s family. The museum is located by the Plaza de Merced , Picasso’s birthplace. It is open to the public between 10am and 6pm during the winter months staying open until 8pm during the summer months. The entrance fee is €9 with reduced rates for students, children and pensioners. Joan Miro was an Catalonian artist of some note, you will come across his work all around Barcelona starting with a large mosaic located at the airport. Joan Miro was born in Barcelona on the 20th April 1893 and became one of the most important representatives of surrealism. The foundation was initiated by the artist with the museum opening in 1975., it now houses over 10.000 painting, drawings and sculptures, the earliest ones from 1901. The museum opens to the public Monday to Saturday from 10am to 6pm ( slightly later during the summer months ). The entrance fee is €12 for adults, children go in free. The Royal Monstery of Guadalupe is located in the province of Caseres in the autonomous region of Extremadura. 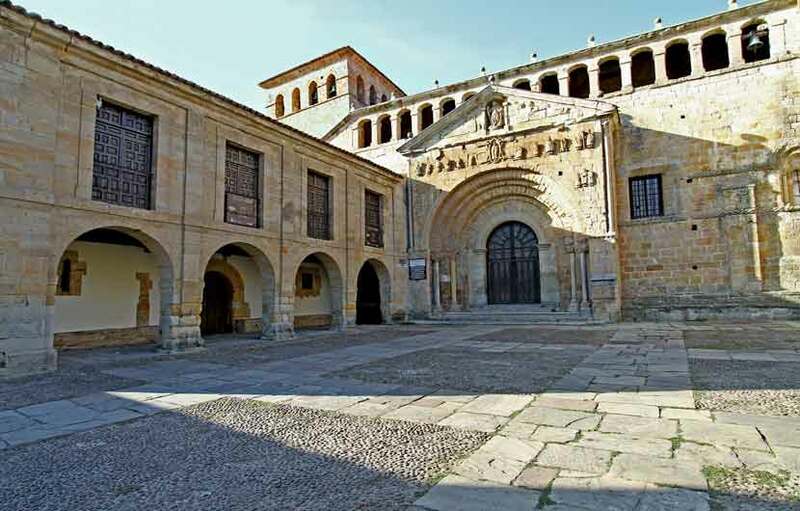 It is home to an outstanding repository of four centuries of Spanish religious architecture. Two major events which occurred in 1492 are symbolised at the Royal Monastery, the reconquest by the Catholic Kings and the arrival to the Americas by Christopher Columbus. There is a famous statue of the Virgen Mary which became a powerful symbol during the Christianisation of the new world. What ever your religious beliefs are you will surely be impressed by the shear beauty of the stunning monastery. Salvador Dali was a Catalan artist, sculptor, author and film maker who made a great impact on the art world during the 20th century with his incredible surrealist artwork and flamboyant personality. 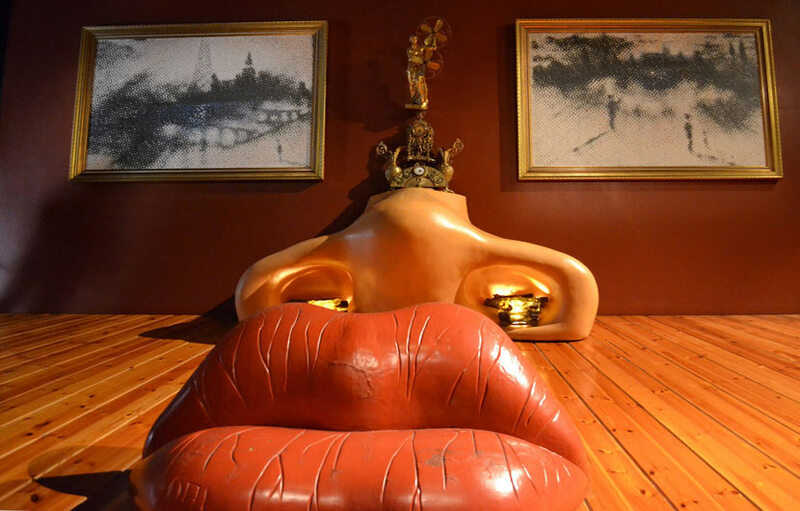 The Salvador Dali museum is located in Figueres, his place of birth and where his body is buried. Figueres is located about a two hour drive north of Barcelona, the transport services are very good and can be easily accessed by train, road or bus. The museum was created by Dali himself and currently houses the largest surrealist works of art in the world. Although his works may not be to the liking of everyone, his genius is plain to see and the museum is well worth visiting to step into the surrealist world of such a unique personality. And if you think this may be one of the lesser attractions in Spain, a staggering 1.4 million people visited the museum in 2017! There are various entrance tickets you can buy online or at the main entrance, depending on the type of tour. The basic unguided tour price for the popular Dali-Theatre Museum costs €14 with reduced rates for groups, students, with free entrance for children up to 8 years of age. The Balearic Islands consist of the islands of Mallorca, Menorca Ibiza and Formentera and are home to some of the most incredible beaches and coves you will find anywhere in Spain. 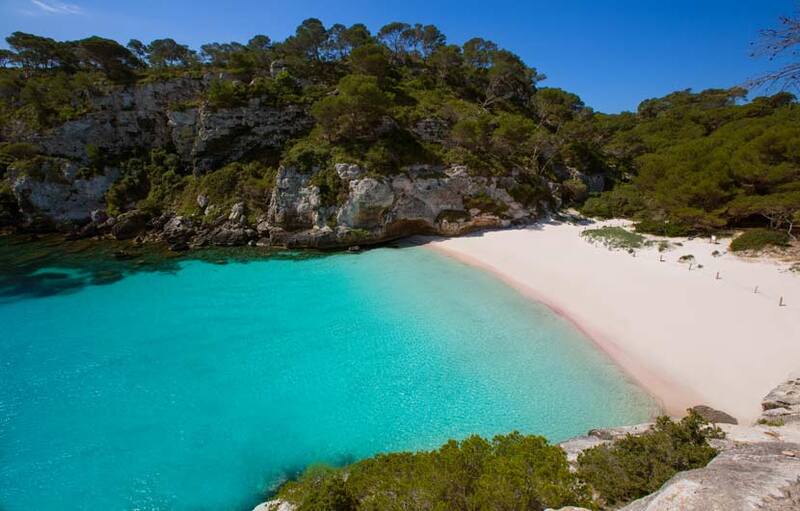 One of the top reasons why visitors enjoy Balearic Island holidays year after year are its incredible beaches. beaches although there are really so many to enjoy. The pick of the best include Illetas beach on Formentera, Cala Comte on Ibiza, Cala Macarelleta on Menorca and the Pollenca and Alcudia beaches of Mallorca. 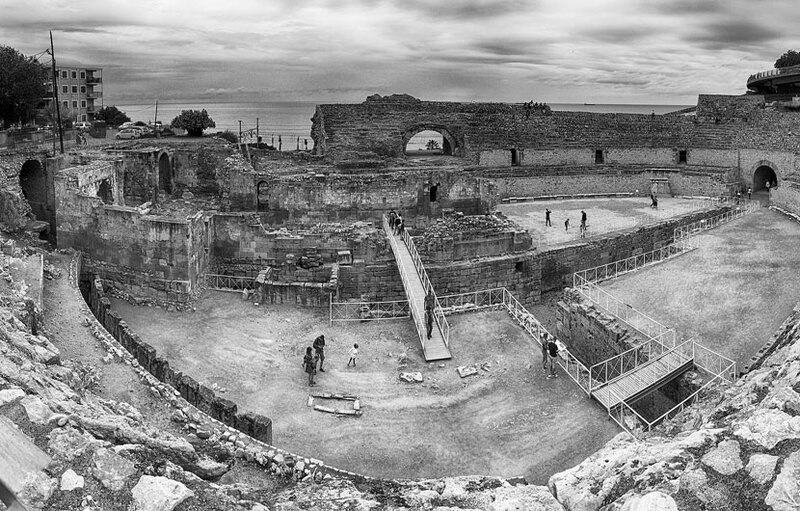 The Roman Amphitheatre is located in the Catalonian province of Tarragona around an hours drive south of Barcelona. This impressive structure was built in in the 2nd century AD boasting a capacity for over 15.000 spectators who often watched the famous gladiators battle with wild animals. In 259 the Christians where persecuted by Emperor Valerian many of which where burned alive within the amphitheatre. In the 18th century it was even used as a prison. Merida is located on the region of Extremadura in south west Spain. This ancient city was founded in 25 B.C by the Roman Emperor Augustus and it soon became the economic and cultural capital of Lusitania, the western most province of the powerful Roman Empire. Because of its great importance to the empire, Merida was lavished with attention from Rome which is evident all around the city. The impressive Roman Theatre was built in 16 B.C. Decorative mosaics, art, sculptures and ceramics are all on display at the National Museum of Roman Art. The archaeological site at Merida received World Heritage status by UNESCO in 1993. La Boqueria indoor food market is one of the largest and most important in Spain and a perfect place to drool over the many kinds of fruit, vegetables Spanish hams, fresh seafood, tapas and other delights on offer. La Boqueria is situated half way up Las Ramblas and has been the beating heart of Barcelona since 1836 with over 200 traders offering a huge selection of gastronomic products. The market is open Tuesday to Thursday from 8am to 3pm and Fridays and Saturdays from 8am to 5pm, it closes on Mondays. There is an area on the second floor of the market which organises events and classrooms for cooking classes. Top chefs offer classes on local and international gastronomy, for more details see the BCN website. The grandiose historic city and stylish resort of San Sebastian is located in a privileged position within the Basque Country in Northern Spain. Amongst its many attractions is the incredibly gastronomy on offer which is high on the agenda as San Sebastian boasts the highest number of Michelin starred restaurants in one city. The city offers fine dining experiences for the most sophisticated palates as well as numerous smaller tapas ( pintxos) restaurants for you to experience the city’s quirky spin on traditional Spanish tapas. See our San Sebastian restaurant guide for full details. The Thyssen-Bornemisza Museum is located in central Madrid and is regarded by many critics to be one the finest private art collections in the world. It was assembled by the Swiss born industrial magnate Baron Heinrich Thyssen-Bornemisza and his son Hans Heinrich. The collection known as the “Golden Triangle of Art” houses western art from the primitive Flemish and Italian painters to the 20th modern works such as pop art. The museum was bought by the state in 1993 as a compliment to the El Prado and Queen Sofia museums, also located in Madrid. Artists works on show include those of Picasso, Van Eyck, Holbein and Rubens. The permanent collections section of the museum is open to the public each week Tuesday to Sunday from 10am to 7pm ( 12am to 4pm on Mondays ). The basic entrance fee is €12 per person, €10 for groups and €8 for pensioners, children under the age of 18 and teachers get in free. The Timanfaya National Park is located in the southwestern part of the island of Lanzarote on the Canary Islands. 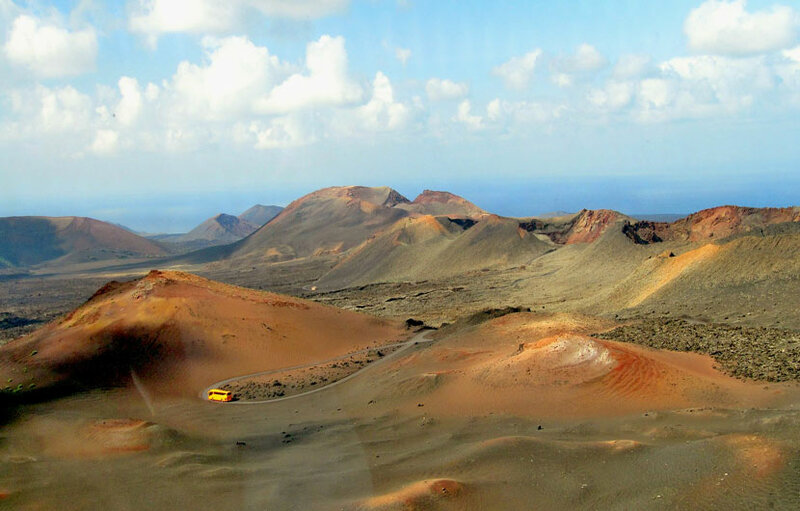 A holiday to these fascinating islands would not be the same without visiting the stunning Timanfaya National Park. The unique volcanic landscape of the park was created between 1730 and 1736 when more than 100 volcanoes erupted devastating the southern of the island including several villages. Thankfully the volcanoes have not erupted since 1824, however due to lack of rain and erosion the landscape looks pretty much as it did just after the last eruptions occurred. Timanfaya was declared a national park in 1968. Visitors are treated to Martian like landscapes, stunning scenery and rare plants and fauna. Just a few metres below the surface the temperature reaches around 650°C and anything thrown into deep holes catches fire immediately. The park opens 7 days a week from opening hours 10.00am to 6pm, admission is €8. The city of Seville is the capital of the autonomous region of Andalucia and is Spain’s fourth-largest city. The first high-speed railway line in the country – the Madrid-Seville AVE line, opened in time for the 1992 World Expo held in the city. 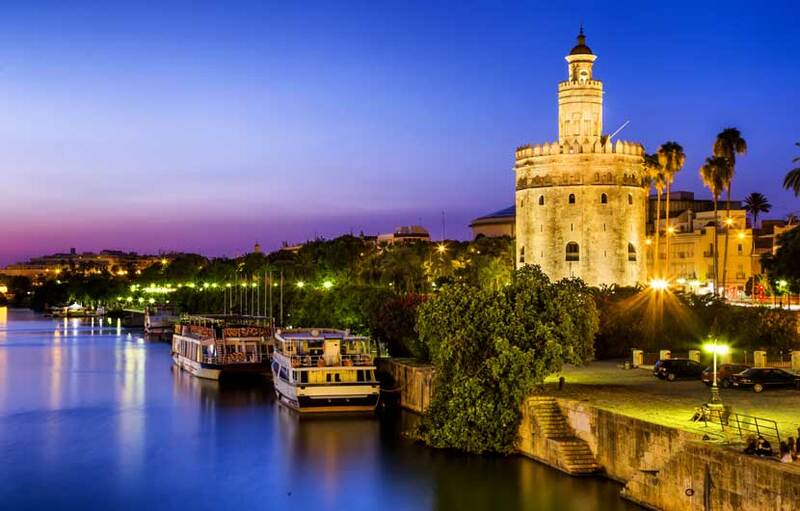 Seville is a cultural hub in Andalucia with long and varied historic and cultural past and home to some of the finest monuments and ancient sites in Spain. The top sites to visit include the impressive cathedral, the rambling Alcazar gardens, the riverside Torre del Oro (Golden Tower), the banks of the Guadalquivir River, the Almohad walls, La Giralda and the famous La Maestranza bullring, the oldest of its kind in the world. You don’t have to be a football enthusiast ( although it definitely helps ) to enjoy a tour around one the top Spanish football stadiums. Many now offer tours to visitors showing off the ground, practice facilities, the cup room and much more. The pick of the stadiums include the home of Madrid at the Santiago Bernabeu Stadium and of course the Camp Nou Football Stadium, home to Barcelona. The Camp Nou experience tour runs every half hour and costs €25, Pensioners and children from 6 to 13 pay €20. Admission to the impressive Madrid’s Football Stadium Tour costs €25 for adults and €18 for children up to 14 years of age. The Montserrat Monastery sits impressive in the mountains high above the city of Barcelona and is a must place to visit for all travellers to Catalonia. The Benedictine Monastery of Santa Maria de Montserrat is situated around 1.200 meters up high in the mountains and makes for an impressive site from miles around. Once arrived visitors are treated to incredible views over Barcelona and the surrounding countryside. Top attractions at the monastery include the Black Madonna, Gregorian chants sung daily by 50 boys from the “Escolania de Montserrat” the monasteries boarding school and the museum which houses works by Dali, El Greco, Monet and Giordano. There are plenty of places to enjoy a picnic around the monastery grounds and few eateries if you prefer to eat local and al fresco. The Correlejo National Park is located a short drive from the town of Corralejo in the north-east of the Canary Island of Fuertventura. It is the best place you can visit to enjoy a dessert experience with its enormous expanse of white sands lapped by the turquoise waters of the Atlantic Ocean. A wild and varied landscape of volcanic and dessert alongside a dramatic and rugged coastline make this an unique and fascinating place to visit. Spending a day out in the park you can enjoy lazing on one of the stunning beaches or trek to the top of Red Mountain. Tabernas dessert is located within the province of Almeria in the autonomous region of Andalucia in southern Spain. Tabernas is Europes only dessert with 3000 annual sunshine hours, temperatures ranging from -5 to 47C and an annual rainfall of just 200mm. Its baron rocky appearance has made it a firm favourite location for movie makers staking its claim as part of international film history. 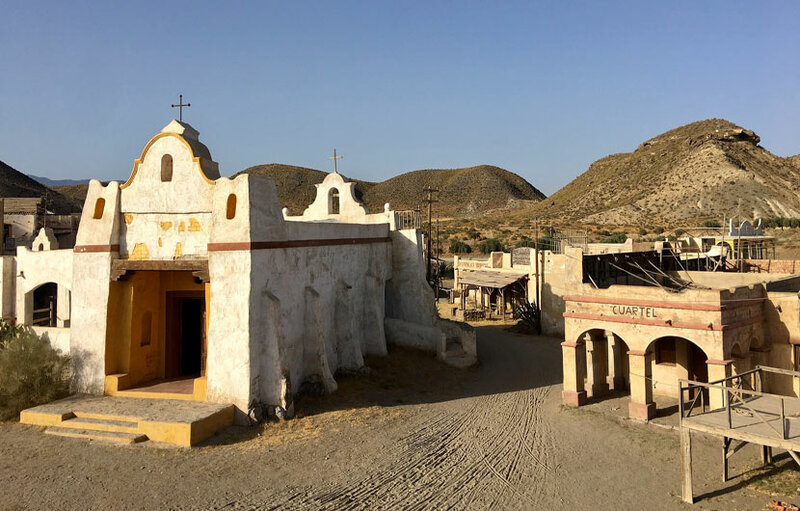 Many film sets have been constructed around Tabernas over the years some of which are open to those looking to enjoy a wild west cowboy experience. Some of the top films, TV series and music videos filmed around Tabernas include a Fistfull of Dollars, Tobruk, Game of Thrones, Doctor Who and Shout Out To My Ex by super girl group Little Mix.